Open – Final: Han Xiao d. Amaresh Sahu, -8,6,4,12,10; SF: Xiao d. Raghu Nadmichettu, -13,5,-4,6,14,9; Sahu d. Charlie Sun, 5,12,7,-9,-10,8. 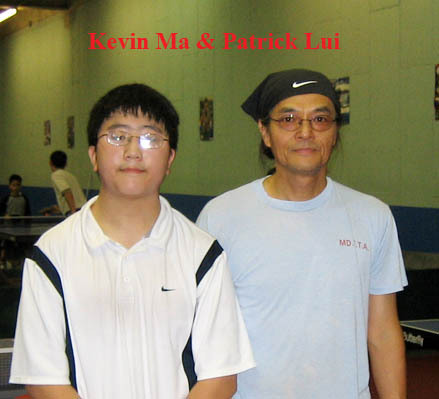 U2300 – Final: Kevin Ma d. Patrick Lui, -7,7,5,-9,13; SF: Ma d. Justin Kung, def. ; Lui d. Albert Senter, -9,7,3,9. 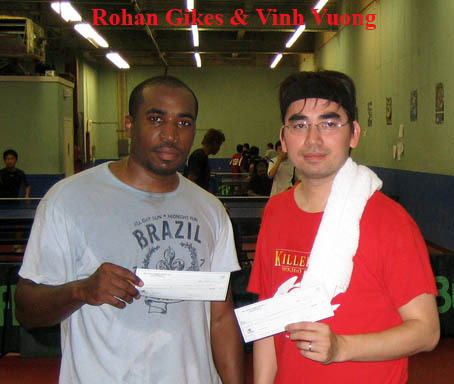 U2150 – Final: Vinh Vuong d. Rohan Gikes, -10,5,8,5; SF: Vuong d. Reginal Willis, -7,5,2,3; Gikes d. Patrick Lui, -9,11,-7,11,12. U2000 – Final: Wondug Han d. Albert Senter, 5,7,8; SF: Han d. Changqing Xu, -8,4,5,5; Senter d. Reginal Willis, -12,7,-8,6,8; QF: Xu d. Hossein Sharifi, 3,-7,4,9; Senter d. Paul Rasay, -6,10,7,5. U1850 – Final: Vikash Sahu d. Hossein Sharifi, 13,-3,9,9; SF: Sahu d. John Hsu, 4,13,9; Sharifi d. Gordon Gregg, 4,7,10; QF: Sahu d. Paul Rasay, 6,-2,7,-6,6. 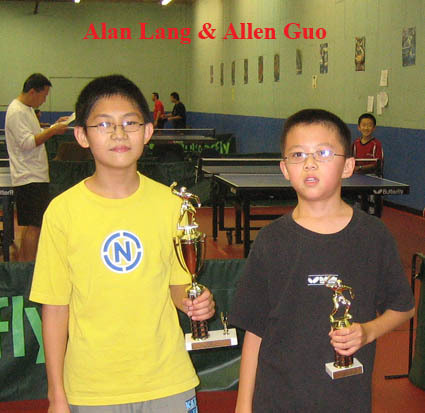 U1600 – Final: Alan Lang d. Allen Guo, 8,11,7; SF: Lang d. Hong Jun Ryu, 6,6,7; Guo d. Calvin Lo, 8,7,9. U1350 – Final: Ricky Carter d. Edgar Bailiff Jr., 6,7,6; SF: Carter d. Matthew Sedlock, 5,10,-10,9,8; Bailiff d. Elliott Hamilton, 12,14,5. 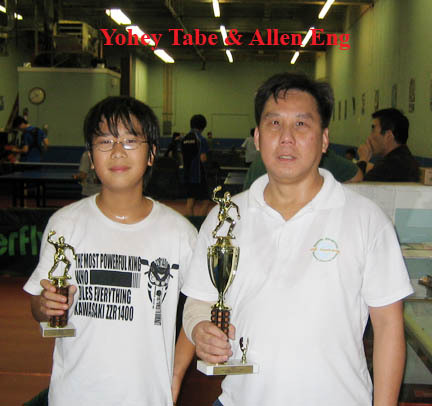 U1100 – Final: Allen Eng d. Yohey Tabe, 6,2,6; SF: Eng d. Michael Ip, 7,2,9; Tabe d. Alan Yan, 3,9,8. The MDTTC September Open was again a success, bringing in table tennis players from the Maryland, Virginia, Pennsylvania and New York areas. 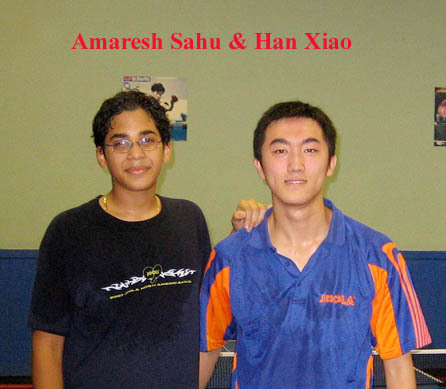 In the open final, Han Xiao (2586) romped over Amaresh Sahu (2263), winning the final four straight. In the U2300 event, Amaresh Sahu won the final over Khurram Aziz (2194), who upset Richard Doverman (2251) in the semifinals. 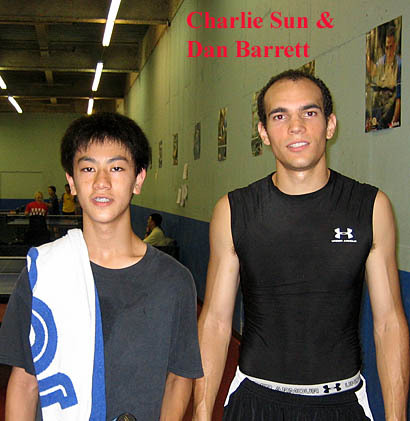 In the U2200 event, Charlie Sun (2063) defeated Dan Barrett (1834) in decisive 3-0 fashion. 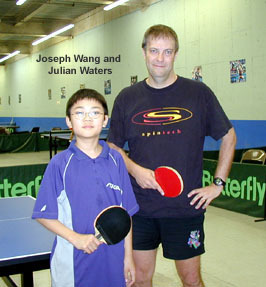 Julian Waters (1997) won the U2050 event over Patrick Lui (1892), 3-1. The U1900 event was won by John Olsen (1840), who defeated Albert Senter (1838) in the final. Won U1650 event by beating James Zhou (1065) won both U1400 and I1100 events, defeating Yiheng Zhao (1188) in the final of the U1400 and Ryan Lin (716) in the U1100. 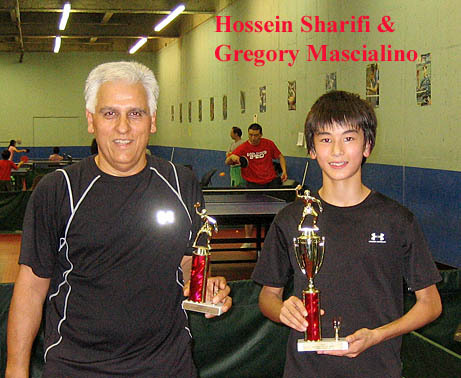 In U1650 event, Gregory Mascialino fought back from behind 0-2 and beat Hossein Sharifi in five in the final. Open – Final: Han Xiao d. Amaresh Sahu, 14,8,4,5; SF: Xiao d. Khurram Aziz, 9,8,5,2; Sahu d. Richard Doverman, 0,7,-10,8,-9,6; QF: Xiao d. Charlie Sun, 8,8,-10,-9,2; Aziz d. Kevin Ma, -11,9,0,7; Doverman d. Scott Lurty, 7,9,6; Sahu d. Sutanit Tangyingyong, 6,7,7. 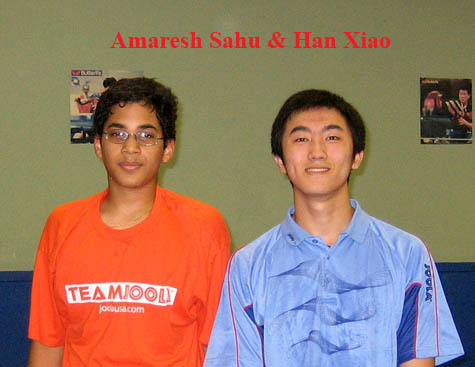 U2350 – Final: Amaresh Sahu d. Khurram Aziz, 8,-4,7,8; SF: Sahu d. Charlie Sun, 9,-9,9,9; Aziz d. Richard Doverman, 5,-9,9,9; QF: Sahu d. Janice Lan, 8,6,7; Sun d. Justin Kung, 8,-8,6,4; Aziz d. Dan Barrett, 9,9,9; Doverman d. Bernard Eballar, 9,5,4. U2200 – Final: Charlie Sun d. Dan Barrett, 4,6,8; SF: Sun d. Phil VanDusen, 3,1,3; Barrett d. Sutanit Tangyingyong, 8,-8,9,-9,9; QF: Barrett d. Patrick Lui, -9,8,6,6; VanDusen d. Xinsheng Michael Huang, 7,-7,7,6. U2050 – Final: Julian Waters d. Patrick Lui, -8,7,11,8; SF: Waters d. Dan Barrett, 3,7,6; Lui d. Alan Pruce, 8,3,8; QF: Barrett d. Albert Senter, 1,4,2. U1900 – Final: John Olsen d. Albert Senter, -8,8,7,4; SF: Olsen d. Jackson Liang, 4,6,-13,10; Senter d. Vikash Sahu, 6,3,-8,1. U1650 – Final: Gregory Mascialino d. Hossein Sharifi, -13,-6,6,4,7; SF: Mascialino d. Ibrahim Abdullah, 5,11,8; Sharifi d. Raymond Chen, -9,10,-8,10,7; QF: Sharifi d. Pavan Bhargava, 6,1,4; Mascialino d. Tong Tong Gong, 4,8,6. U1400 – Final: James Zhou d. Yiheng Zhao, 7,-9,8,9; SF: Zhou d. Victoria Xu, 4,4,-6,-11,9; Zhao d. Elliott Hamilton, -9,9,-10,3,6; QF: Zhao d. Dongshiun Lin, 9,-8,3,10; Zhou d. Ryan Lin, -6,5,6,-10,12. U1150 – Final: James Zhou d. Ryan Lin, -9,7,7,5; SF: Zhou d. Peggy Liang, -9,7,7,5; Lin d. Michael Ip, 7,3,7. 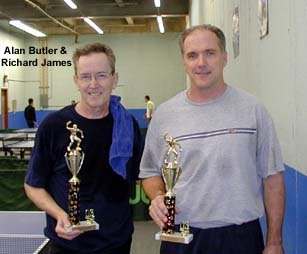 The 2007 Butterfly MDTTC April Open was a success, with players from Maryland, Virginia, West Virginia and Pennsylvania competing for two days for eight championship trophies in the Open and rating events. In the Open, the top two seeds cruised to the final, with Han Xiao (2562) defeating Amaresh Sahu (2238), and Huang Bang Chao (2495) defeating Raghu Nadmichettu (2344), 4-0 and 4-1 respectively. In the final, Han was down 2-3 in games, but came back in the seventh from down 6-9 and 8-10 double match point to win, 12-10 in the seventh. This was an exciting match with both players hitting amazing shots, always keeping the crowd on its toes. In the Under 2300 event, Amaresh Sahu defeated Edward Watts (2160) in the final, 3-0. 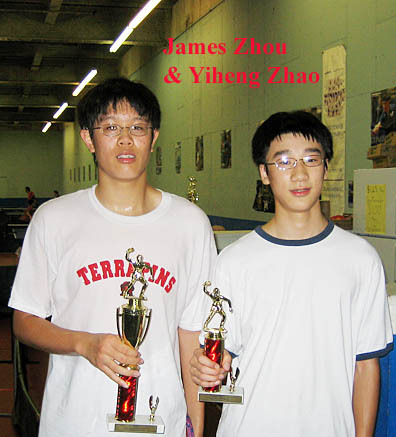 In the Under 2150 final, Sutanit Tangyingyong (2004) faced David James (1827), with Sutani winning 3-0. Julian won the Under 2000 final over Bernard Nkoume (1761), 3-1. The Under 1850 event was won by John Olsen (1781), who overcame HaiChang Wei (1550) in a five-game battle. 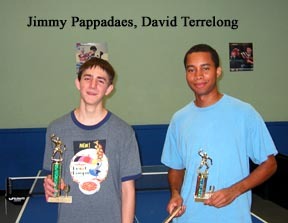 In the Under 1150 event, the top two seeds faced off in the final, with Johnny Troung (981) beating David Jia (971) 3-0. Johnny Truong also won Under 1350 by beating Gorge Nie 3-1. Open – Final: Han Xiao d. Huang Bang Chao, -7,8,10,-7,-7,8,10; SF: Xiao d. Amaresh Sahu, 8,4,10,6; Huang d. Raghu Nadmichettu, -7,4,5,8,5; QF: Xiao d. Kevin Ma, 6,-9,4,7; Sahu d. Edward Watts, 5,9,7; Nadmichettu d. Charlie Sun, 6,9,-9,8; Huang d. Sutanit Tangyingyong, 8,5,9. U2300 – Final: Amaresh Sahu d. Edward Watts, 4,6,8; SF: Sahu d. Kian Mokhtari, 7,-9,6,2; Watts d. David James, 6,4,10; QF: Mokhtari d. Mohamed Kamara, 6,5,9; James d. Sanxia Gong, 5,-6,-9,10,8. U2150 – Final: Sutanit Tangyingyong d. David James, 5,8,8; SF: Tangyingyong d. Xinsheng Michael Huang, -8,3,6,6; James d. Julian Waters, -7,-9,9,10,8. U2000 – Final: Julian Waters d. Bernard Nkoume, 6,7,-5,7; SF: Waters d. Reginald Willis, -7,8,7,9; Nkoume d. Raul Rasay, 9,9,8. U1850 – Final: John Olsen d. HaiChang Wei, -7,7,-11,8,4; SF: Olsen d. Raul Rasay, 4,-3,5,7; Wei d. Carson Truong, 9,9,7. U1600 – Final: David Goldstein d. Quang Lam, 9,10,-14,-8,9; SF: Goldstein d. Gabriel Lu, 6,-10,6,9; Lam d. Pavan Bhargava, 14,-10,9,-7,12; QF: Bhargava d. Varvara Zemskova, -10,7,4,-8,5. U1350 – Final: Johnny Truong d. George Nie, 4,6,-7,6; SF: Truong d. Shaheer Tariq, 4,6,-8,5; Nie d. David Jia, 8,-8,8,9. U1100 – Final: Johnny Truong d. David Jia, 5,1,9; SF: Truong d. Peggy Liang, -9,3,8,6; Jia d. James Zhou, 9,-4,-7,5,7; QF: Zhou d. Richard Lin, 6,7,6; Liang d. Linda Zhou, 7,-4,12,-10,7. The 2007 MDTTC Butterfly Winter Open event was highly contested between a number of players, including the top two seeds, Han Xiao (2588) and Huang Bang Chao (2467, but as high as 2665 just last year). 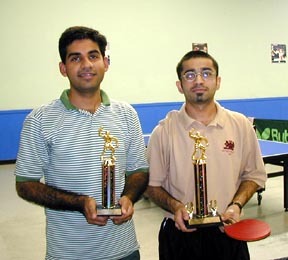 Other players with title hopes included the always pumped up Qasim Aziz (2378) as well as Raghu Nadmichettu (2344). Junior players also made a strong showing, led by Peter Li (2286) and Amaresh Sahu (2230). The round robins saw their share of excitement. In Group 1, while Xiao took the group easily, Bernard Eballar (1848) pulled off a surprising 3-1 victory over Stephen Hochman (2101). 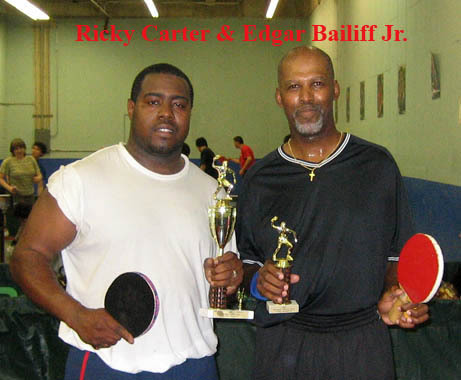 While both players had difficulty returning serve, Eballar was able to come out on top in the rallies. In Group 2, Huang likewise breezed through the group without dropping a game. In the match for second place in the group, Barbara Wei (2123) took a quick 3-0 victory over Joseph Wang (2167) to take a place in the quarterfinals. The third round robin proceeded without much drama, with the top two seeds Aziz and Sahu advancing as expected. In the final group, Peter Li advanced first in the group over Nadmichettu, but both were able to advance. In the quarterfinals, the top two seeds, Xiao and Huang, both advanced 3-0. 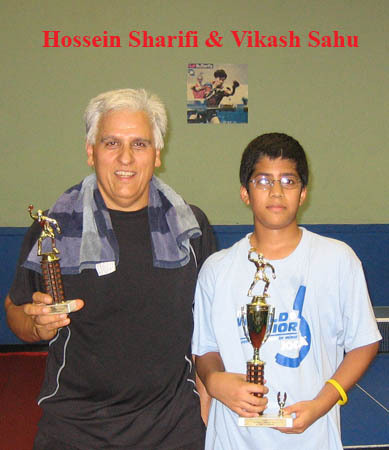 However, Sahu surprisingly triumphed 3-0 over Li, and Nadmichettu surprised Aziz, 3-1. Aziz played a bit tight during the match due to a recent change in the brands of rubber he is using. The semifinals once again saw the two top seeds cruising, Xiao over Sahu 4-0, Huang over Nadmichettu 4-0, setting up an interesting final. The final was closely contested and very tight, with a couple games going to deuce, but in the end Huang was able to pull away from 2-2 in games to a 4-2 victory, winning the last two games 11-8. Congratulations to all who participated in a hard-fought tournament. Open – Final: Huang Bang Chao d. Han Xiao, 10,-6,10,-8,8,8; SF: Huang d. Raghu Nadmichettu, 4,6,5,5; Xiao d. Amaresh Sahu, 3,4,5,6; QF: Xiao d. Barbara Wei, 8,3,9; Sahu d. Peter Li, 7,6,8; Nadmichettu d. Qasim Aziz, 6,8,-8,8; Huang d. Bernard Eballer, 6,1,4. U2050 – Final: David Jarrin d. Albert Senter, -6,8,6,8; SF: Jarrin d. Xinsheng Michael Huang, -9,5,11,5; Senter d. Samuel K. Huang, 8,11,3; QF: Jarrin d. Thomas Lo, 10,7,10; X.M. Huang d. Jimmy Pappadeas, -8,4,9,8; Senter d. Frank Lee, 5,9,4; S. Huang d. Gordon Lee Gregg, 13,-6,7,5. U1900 – Final: Nathan Kung d. Vikash Sahu, 9,9,10; SF: Kung d. Nitesh Batra, 3,6,9; Sahu d. Phil VanDusen, 9,6,9; QF: VanDusen d. Paul Armentano, 9,-8,9,6; Sahu d. Raul Rasay, 10,-10,8,-7,5; Batra d. Carson Truong, -10,2,-9,6,8; Kung d. Adam Sylvester, 9,5,4. U1650 – Final: Joey Goldstein d. Morton Greenberg, 8,8,-8,-8,8; SF: Greenberg d. Paul Rasay, -10,-11,6,6,10; Goldstein d. Scott Barnett, 9,8,8; QF: Rasay d. Carson Truong, 2,3,5; Greenberg d. Benjamin Huang, 8,11,-11,6; Goldstein d. Paul Armentano, 6,9,8; Barnett d. Matt Jarrett, -8,-6,7,7,10. U1400 – Final: Gabriel Lu d. Zach Jarrett, 6,5,-9,-4,7; SF: Jarrett d. Dongshiun Lin, 3,4,8; Lu d. George Nie, 9,4,9. U1150 – Final: Dongshiun Lin d. Elliott Hamilton, 10,10,11; SF: Hamilton d. Allen Guo, 9,7,-10,7; Lin d. Calvin Lo, 5,3,5. 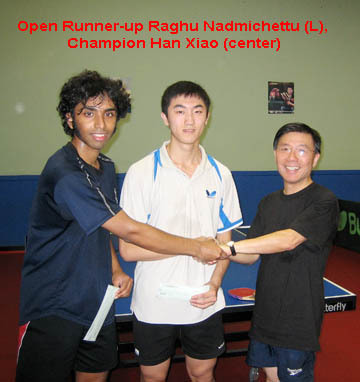 The Open Final of Butterfly MDTTC October Open saw a very exciting battle between Han Xiao and Raghu Nadmichettu. Han Xiao defeated Raghu Nadmichettu in a close battle, 4-3! Raghu forced the seventh game by pulling out game six, 20-18! The tournament attracted about 80 players from MD, VA, NY, RI and PA. Thanks to all participants and visitors for making this tournament a success! Open – Final: Han Xiao d. Raghu Nadmichettu, 9,-6,7,8,-10,-18,8; SF: Xiao d. Marcus Jackson, 4,5,8,7; Nadmichettu d. Nazruddin Asgarali, -6,-10,7,8,8,10; QF: Jackson d. John Wetzler, 7,5,8; Asgarali d. Joseph Wang, 4,12,9. U2200 – Final: Lixin Lang d. Hiep Tran, 9,-8,3,3; SF: Lang d. Richard Bowling, 7,9,-8,2; Tran d. Joseph Wang, 6,-7,6,7; QF: Tran d. Charlie Sun, 8,10,7. U2050 – Final: Rohan Gilkes d. Yongqiang Zhang, 5,9,-9,9; SF: Gilkes d. Sutanit Tangyingyong, -6,6,5,-9,8; Zhang d. Julian Waters, 8,-9,12,8; QF: Gilkes d. Dan Barrett, 9,9,-9,-9,9. U1900 – Final: Reginald Willis d. Justin Kung, 7,-7,12,-8,5; SF: Willis d. Philip VanDusen, 12,6,5; Kung d. Jeffery H. Smart, 10,-10,7,-2,6. U1850 – Final: Xin Jia d. Nathan Kung, 5,1,10; SF: Xin d. Thomas Lo, 14,-4,8,7; Kung d. Rohit Dewan, -5,-9,9,3,8. U1600 – Final: Carson Truong d. Kuo Guo, -4,7,9,5; SF: Truong d. David Goldstein, 4,14,4; Guo d. Alan Lang, 5,8,6; QF: Guo d. David Wang, 7,11,7. U1350 – Final: David Goldstein d. Vikram Raja, 4,8,9; SF: Goldstein d. Matt Sedlock, -14,4,1,4; Raja d. George Nie, 9,5,8; QF: Sedlock d. Varvara Zemskova, 12,5,9. 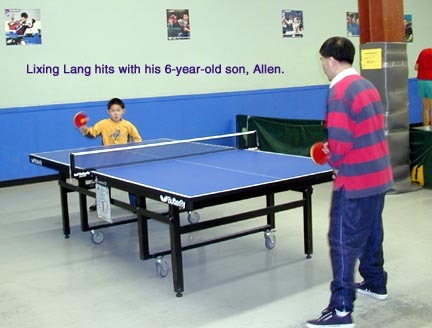 U1100 – Final: Alan Lang d. Vikram Raja, 3,-7,8,10; SF: Lang d. Jackson Liang, 8,7,-5,8; Raja d. Matt Sedlock, 7,5,10; QF: Liang d. Allen Guo, 8,3,3. The Butterfly MDTTC June Open saw Players from MD, VA, PA, DC and VT compete for eight events at the Maryland Table Tennis Center. The Open was very competitive due to Han Xiao’s absence (training in China). In the preliminary rounds, there were no upsets in the three groups. However, top seed John Wetzler (2285) had to fight very hard against USA cadet team member Joseph Wang in group one. Joseph led 7-3 in the seventh, but John fought back to 10-all. At 12-12, John missed his own serve, and then popped Joseph’s serve very high and close to the net, and then stumbled to his left, leaving the table open. Joseph would have won the match by simply returning the ball to the John’s right, but he put the ball into the net to make it 13-all. John finally won 16-14! Second and third seeds Nazruddin Asgarali (2280) and Raghu Nadmichettu (2245) won their groups easily. The top two from each group advanced into the quarterfinals, with the top two seeds (John and Nazruddin) getting byes. In the quarterfinals, 13-year-old Peter Li (2245) defeated Charlene Liu (2092), and Raghu Nadmichettu (2245) defeated Joseph Wang (2092). In the semifinals, Raghu, who usually plays very well against Nazruddin, won 4-0. 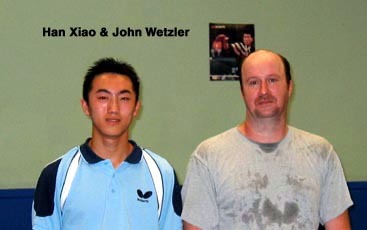 John Wetzler needed six games to beat Peter Li in the other semifinal. 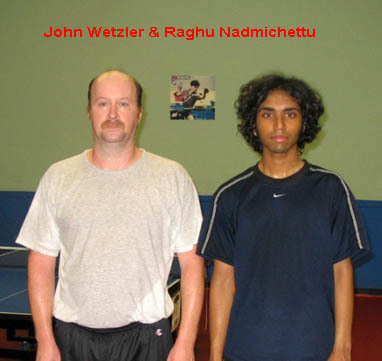 John continued to play well in the final and won the Open over Raghu, 4-1. 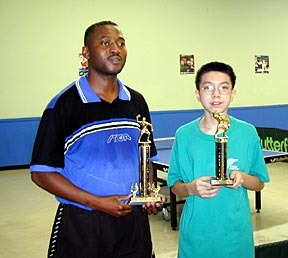 Congratulations to John for his second MDTTC Open title. In the U1950 event on Saturday, top seed Julian Waters was upset by 1782-rated Junior Jimmy Pappadeas in the semifinals. Stephen Hochman from MATTA won the event over Jimmy, 3-2. 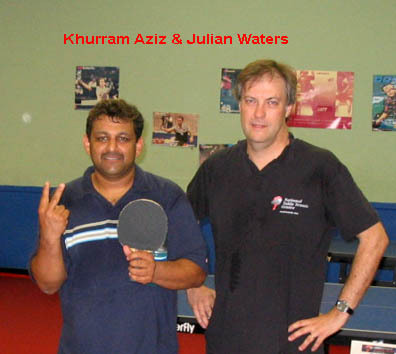 In the U2100 event, Khurram Aziz (2098) won the over Julian Waters, 4-1. In the U2250 event Joseph Wang (2092), who had played well throughout the tournament but had yet to pull off an upset, finally got one from Khurram Aziz. However, Joseph could not keep his momentum going and lost in the semifinals to Peter Li (2243). 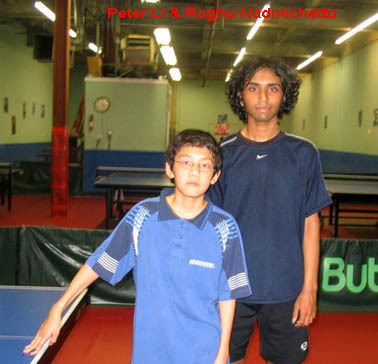 The final was between the top two seeds, Peter Li and Raghu Nadmichettu, with Raghu coming away with a 3-1 victory. 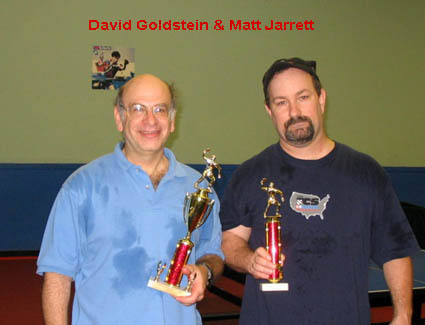 In Sunday’s events, Matt & Zach Jarrett (father and son) from PA reached the U1400 and U1150 finals, respectively, and got second-place trophies, with local David Goldstein and Johnny Truong winning the two events. Wilson Liu, a professor from James Madison University, won the U1900 event, and Carson Truong the U1650 event. Open – Final: John Wetzler d. Raghu Nadmichettu, 5,8,-10,7,14; SF: Wetzler d. Peter Li, 8,-7,5,-7,9,4; Nadmichettu d. Nazruddin Asgarali, 8,6,6,8; QF: Nadmichettu d. Joseph Wang, 2,-6,6,7,1; Li d. Charlene Liu, 6,9,7,-7,8; Wetzler-bye; Asgarali-bye. U2250 – Final: Raghu Nadmichettu d. Peter Li, -16,7,6,9; SF: Nadmichettu d. Khurram Aziz, 5,5,6; Li d. Joseph Wang, 9,6,8; QF: Aziz d. Jimmy Pappadeas, -5,-9,7,10,9; Wang d. David Jarrin, 7,7,6; Nadmichettu-bye; Li-bye. U2100 – Final: Khurram Aziz d. Julian Waters, 6,-11,5,7; SF: Aziz d. Bernard Nkoume, 6,6,7; Waters d. Reginald Willis, 8,8,-8,8; QF: Nkoume d. Philip Van Dusen, 12,7,9; Willis d. Jimmy Pappadeas, 8,8,-9,8. 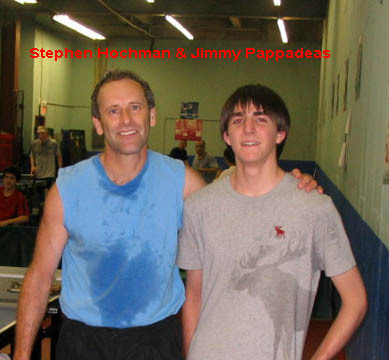 U1950 – Final: Stephen Hochman d. Jimmy Pappadeas, 10,-7,6,10; SF: Hochman d. David Jarrin, -4,6,8,-11,9; Pappadeas d. Julian Waters, 5,8,-10,9; QF: Pappadeas d. Xinsheng Michael Huang, 13,8,-5,-7,11; Jarrin d. Bernard Nkoume, 12,-8,7,-8,7; Hochman-bye; Waters-bye. 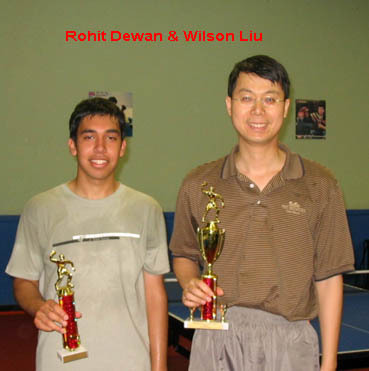 U1900: 1st Wilson Liu, 4-0; 2nd Rohit Dewan, 3-1; 3rd Vikash Sahu, 2-2; 4th Carson Truon, 1-3; 5th Kuo Guo, 0-4. U1650 – Final: Carson Truong d. Vikash Sahu, -6,6,9,-8,7; SF: Truong d. Joey Goldstein, 10,3,-9,13; Sahu d. Kuo Guo, 5,6,9. U1400 – Final: David Goldstein d. Matt Jarrett, 9,7,8; SF: Goldstein d. Donna Rogall, 3,8,10; Jarrett d. Varvara Zemskova, -6,10,7,8; QF: Rogall d. Yiheng Zhao, 9,6,10; Zemskova d. Johnny Truong, 4,5,8; Goldstein-bye; Jarrett-bye. 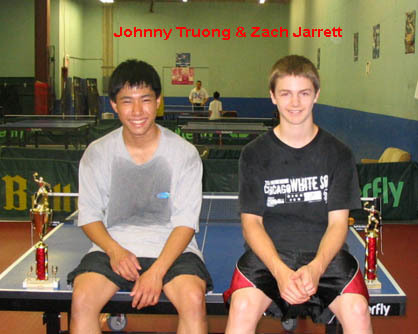 U1150 – Final: Johnny Truong d. Zach Jarrett, 3,9,-14,9; SF: Truong d. Jason Johnson, 7,6,6; Jarett d. George Nie, 8,11,9. 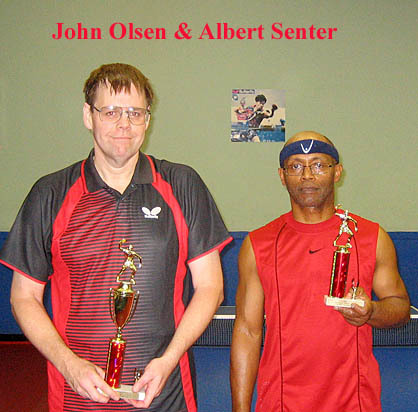 The April Open at the Maryland Table Tennis Center saw players of all different levels once again vying for titles in eight events. In the Open, the usually reliable Lixin Lang (2150) fell in consecutive matches to two junior players, 3-1 to Joseph Wang (2080) in his round robin, then again 3-1 to Reza Ghiasi (2154) in the quarterfinals. Reza found himself quickly down 3-0 to fellow Maryland junior Peter Li (2197) in the semifinals before fighting back to win the next two games at 6 and 9, only to step down in the final game 11-6. 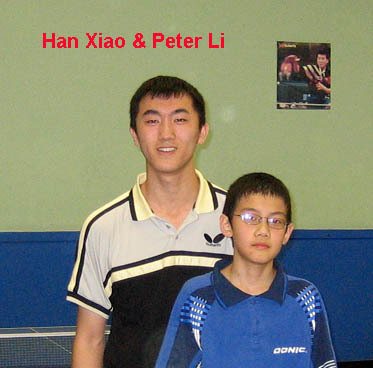 The final was a repeat of the previous Maryland Open, with Peter Li challenging top seed Han Xiao (2571). Han again won 4-0, meeting resistance in the final two games but not quite enough to drop a game. In the Under 2200 event Kevin Ma (1880), who had been playing well throughout the tournament but had yet to pull off an upset, finally got his win thanks to Joseph Wang. However, Kevin could not keep his momentum going, and lost in the quarterfinals to Mark Berg (1924). The final was played between the top two seeds, Peter Li and Lixin Lang, with Peter coming away with a comfortable 3-0 victory. One other notable mention during the tournament was that the finals of the Under 1850 and Under 1600 events were identical. 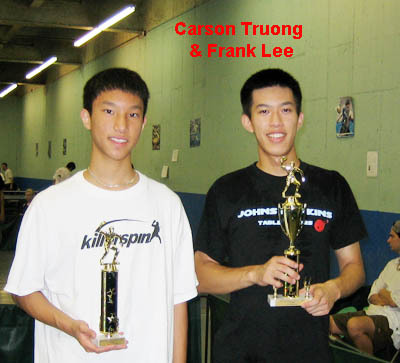 In both events John Hopkins college Student Frank Lee (1570) was able to overcome local junior Carson Truong (1429) in the championship match to win the trophy. Carson had beaten Frank earlier in the Under 1850 preliminary RR. 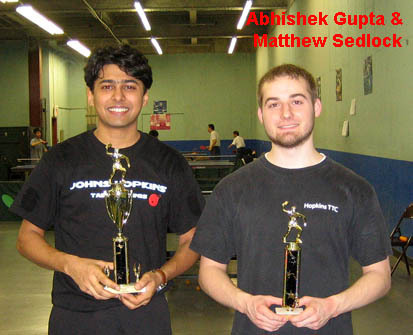 The Under 1100 final was between JHU club players, with Abhishek Gupta winning over Matthew Sedlock in five games. Congratulations to all our winners, and thanks to all our participants for making the tournament a success once again. Open – Final: Han Xiao d. Peter Li, 3,3,8,9; SF: Xiao d. Hiep Tran, 4,4,5,7; Li d. Reza Ghiasi, 8,7,9,-6,-9,6; QF: Tran d. Joseph Wang, -5,7,7,8; Ghiasi d. Lizin Lang, 5,6,-6,10; Li d. Kevin Ma, 8,5,7; Xiao-bye. U2200 – Final: Peter Li d. Lixin Lang, 3,8,6; SF: Li d. Joseph Wang, 8,-9,-6,7,3; Lang d. Mark Berg, 5,4,1; QF: Li d. Charlie Sun, 5,6,6; Wang d. Hiep Tran, -5,9,10,9; Berg d. Kevin Ma, 9,10,-7,4; Lang d. Jimmy Pappadeas, 9,8,4. 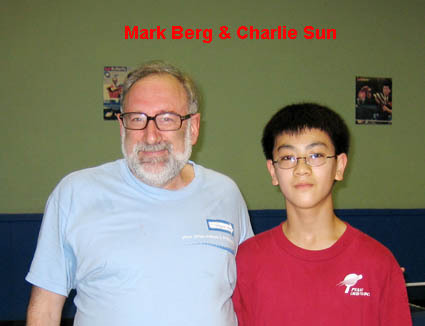 U2050 – Final: Charlie Sun d. Mark Berg, 10,11,7; SF: Sun d. Jimmy Pappadeas, 8,-3,8,7; Berg d. Hyo Won Kim, 9,8,12; QF: Berg d. Paul E. Kotz, -4,6,13,7; Kim d. Janiel Li, -2,7,-8,8,8; Pappadeas d. Toby Kutler, 10,8,8; Sun d. Bernard Nkoume, 6,9,3. 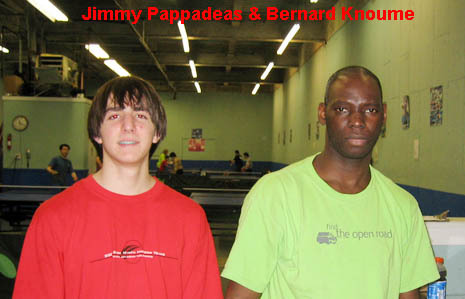 U1900 Final RR: 1st Bernard Nkoume, 4-0; 2nd Jimmy Pappadeas, 3-1. U1850 – Final: Frank Lee d. Carson Truong, 14,-5,14,8; SF: Lee d. Liang Liu, 10,9,-10-2,11; Truong d. David Wang, 8,10,8; QF: Lee d. Orlando Russell, 10,2,8; Wang d. Khoi Duc Than, 6,-2,9,-10,9. U1600 – Final: Frank Lee d. Carson Truong, 11,4,7; SF: Lee d. Khoi Duc Than, 3,11,7; Truong d. Liang Liu, -3,8,6,-9,7; QF: Liu d. John Schollenberger, 5,3,-6,7; Truong d. Paul Armentano, 9,-9,9,8; Than d. Orlando Russell, -6,4,-8,2,4; Lee d. Daniel Kokotov, 8,9,5. U1350 – Final: Daniel Kokotov d. Paul Armentano, 4,6,10; SF: Kokotov d. Matthew Sedlock, 3,4,7; Armentano d. Yiheng Zhao, -8,9,7,-12,7; QF: Sedlock d. Diana Chou, 7,9,-9,8; Zhao d. Abhishek Gupta, def. U1100 – Final: Abhishek Gupta d. Matthew Sedlock, 9,-8,-8,9,10; SF: Sedlock d. Sharon Barry, 5,14,6; Gupta d. Todd Parnell, 9,-4,9,-9,4. 2006 Butterfly MDTTC Winter Open took place at Maryland Table Tennis Center Feb. 11-12. Due to the winter storm that blew out most of the Mid-Atlantic Region that weekend, lots of players had to withdraw from Sunday’s events but the tournament was still held and ran successfully with about 50 entries. In the Open event, there were three groups. Butterfly’s Han Xiao was seeded out. In Group One, Amaresh Sahu (2257) beat 2165 penholder blocker Lixin Lang in five games, and both advanced to the playoffs. An upset happened in Group Two, where 2175-rated Reza Ghiasi was defeated 3-2 by another local junior, Charlie Sun (1819). But Reza fought hard to upset the top-seeded Vitaliy Deyak from Ukraine to advance to the playoff. In Group Three, Raghu Nadmichettu (2226) beat Peter Li (2228) and both advanced. 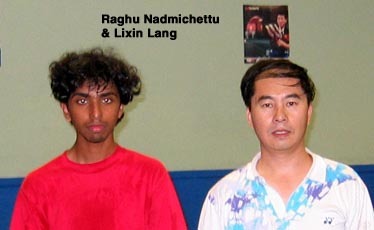 In the Quarters, Raghu continued his good performance to beat Lixin Lang. Coached by Cheng Yinghua, Peter Li fight back to beat Vitaliy 3-1, and Amaresh beat Reza 3-2. The two semifinals were between two college students, Han and Raghu, and two junior players, Peter and Amaresh. Han had to do a little homework to find the way to beat Raghu (-9,11,1, -11,4,7). 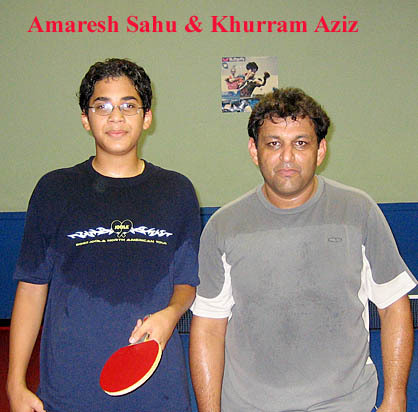 Amaresh beat Peter at the 2005 Nationals Cadet Team Trials on his way to making the USA cadet team for the first time. But this time, his consistent defense was not enough to overcome Peter’s offense, and he lost 4-1. 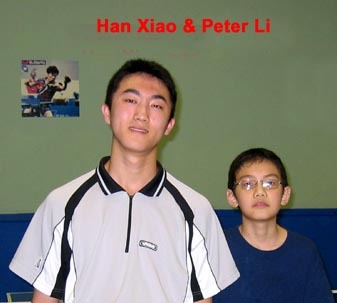 Han beat Peter Li 4-0 in the Final. In the Under 2250 event Vitaliy played well and made many unbelievable shots to beat Lixin Lang in the semifinals and then Raghu in the Final to win the event. 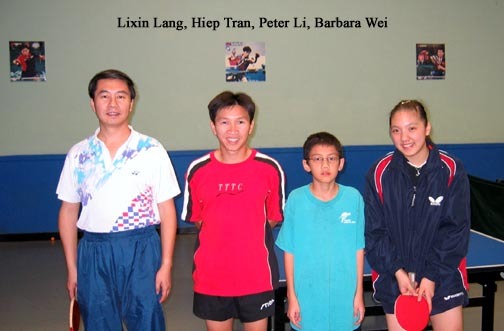 The Under 2100 event was dominated by local juniors. In the Final, third-seeded Kian Mokhtari beat top-seed Kevin Ma, 3-0. 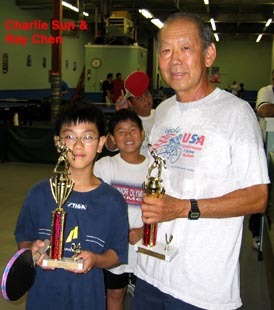 In the Under 1950’s, local dentist Samuel Huang easily won the event with his tricky shots and a variety of serves. On Sunday, the tournament director had to combine some events together since the roughly one foot snow accumulation overnight blocked many players from the tournament. Carson Truong rated 1107, was the only person who won two trophies on Sunday, winning the Under 1150 event and runner-up in the Under 1650 event. Open – Final: Han Xiao d. Peter Li, 11,7,10,5; SF: Xiao d. Raghu Nadmichettu, -9,11,1,-11,4,7; Li d. Amaresh Sahu, 9,-9,5,3,10; QF: Nadmichettu d. Lixin Lang, 6,-8,7,-8,7; Li d. Vitaliy Deyak, 6,-8,11,5; Sahu d. Reza Ghiasi, 12,8,-9,-7,4; Xiao – Bye. U2250 – Final: Vitaliy Deyak d. Raghu Nadmichettu, 10,8,10; SF: Deyak d. Lixin Lang, 8,-8,4,9; Nadmichettu d. Peter Li, 6,14,8; QF: Deyak d. Toby Kutler, 10,5,3; Lang d. Philip Van Dusen, 8,7,9; Nadmichettu d. Kian Mokhtari, 7,-11,6,1; Li d. Kevin Ma, 5,7,5. 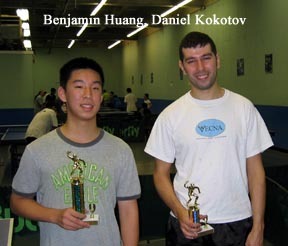 U2100 – Final: Kian Mokhtari d. Kevin Ma, 3,3,5; SF: Mokhtari d. Hyo Won Kim, 6,-2,-5,8,5; Ma d. Charlie Sun, 7,5,9. U1950 – Final: Samuel Huang d. Vancal Rema, 6,8,-8,7; SF: Rema d. Hyo Won Kim, 7,-1,-8,8,5; Huang d. Xinsheng Michael Huang, 8,3,8. U1900: 1st Mohamed Karara; 2nd Eduardo Urbina. U1650 – Final: Caleb Fan d. Carson Truong, -9,9,7,7; SF: Fan d. Joey Goldstein, 10,8,-16,6; Truong d. Mohamed Kamara, -9,7,-5,10,10; QF: Fan d. Benjamin Huang, 11,10,6; Goldstein d. Paul Armentano, 10,9,9; Kamara d. James Zhang, -9,9,3,7; Truong d. Daniel Kokotov, 9,-9,-10,7,8. U1400: 1st Daniel Kovov; 2nd Benjamin Huang. U1150: 1st Carson Truong; 2nd Varvara Zemskova. All other Sunday’s event were combined with no playoffs due to the storm weather. The Open event this month proceeded with fewer surprises than usual. The top six seeds advanced to the quarterfinals as expected. Amaresh Sahu (2080) squeaked by Tom Orlik (2091) 3-2, while Lixin Lang’s (2150) steady blocking game proved to be just a little too much for Khurram Aziz (2040), 3-2. In the semifinals, Amaresh Sahu played three close games against top seed Han Xiao (2565) before losing the next two games each at 6 and the match 4-1. Amaresh seemed to have difficulty returning serve in this match. In the other semifinal, Raghu Nadmichettu (2225) simply overpowered Lixin Lang, winning 4-1 in convincing fashion. In the final, Han Xiao jumped out to a quick 2-0 game on Nadmichettu. Raghu was able to fight back and take a 10-8 lead, but Xiao equalized on an edge ball at 10-9 and won the deuce game, 13-11. He would then win the match four straight by taking the last game 11-8. In other events, Thong Van Bui (1746) pulled off a major upset by defeating Khurram Aziz in the quarterfinals of the Under 2200 event in three close games (9,8,9). Keahan Mokhtari (1742) continued his run of impressive showings at the MDTTC Open by upsetting Charlie Sun (1834), Gary Schlager (1770), Fernando Ramirez (1913), and Julian Waters (1906). He would come in second in the Under 2050 event, where Waters would exact his revenge to win the final. Open – Final: Han Xiao d. Raghu Nadmichettu, 6,6,11,8; SF: Xiao d. Amaresh Sahu, 9,7,-9,6,6; Nadmichettu d. Lixin Lang, 3,9,-9,8,5; QF: Sahu d. Tom Orlik, -10,9,-9,8,4; Lang d. Khurram Aziz, -7,19,8,-4,9. U2200 – Final: Lixin Lang d. Joseph Wang, 9,6,11; SF: Lang d. Fernando Ramirez, 8,6,13; Wang d. Thong Van Bui, 7,5,3; QF: Lang d. Gary Schlager, 5,9,-9,9; Ramirez d. Charlie Sun, 9,-10,-5,7,4; Wang d. Julian Waters, 7,-10,12,7; Bui d. Khurram Aziz, 9,8,9. 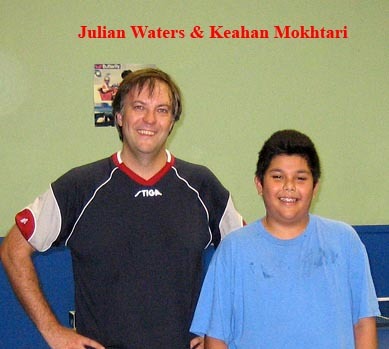 U2050 – Final: Julian Waters d. Keahan Mokhtari, -10,9,10,9; SF: Waters d. Joseph Wang, 10,10,8; Mokhtari d. Fernando Ramirez, 7,9,6; QF: Wang d. Xinsheng Huang, 6,2,-5,5; Waters d. Thong Van Vui, -10,7,4,7; Mokhtari d. Gary Schlater, 11,7,-10,9; Ramirez d. Kian Mokhtari, 2,5,8. U1900 – Final: Charlie Sun d. Reginald Willis, 8,-7,5,-7,4; SF: Sun d. Richard James, 9,7,3; Willis d. Xinsheng Huang, 5,-9,-10,10,8. 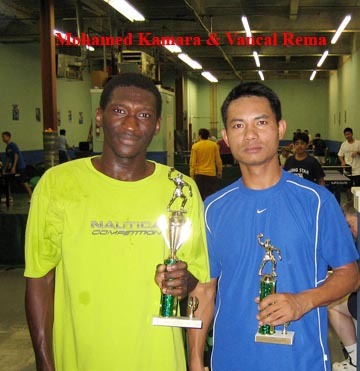 U1850 – 1st Mohamed Kamara, 4-0; 2nd Vancal Rema, 3-1; 3rd Zhen Cai, 2-2. 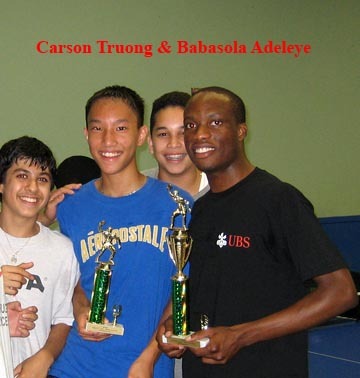 U1600 – Final: Babasola Adeleye d. Carson Truong, 8,6,7; SF: Adeleye d. Benjamin Huang, 4,8,-8,-8,3; Truong d. Daniel Kokotov, 7,-16,-6,8,9; QF: Adeleye d. Gerik Whittington, 7,-10,-10,6,9; Huang d. Caleb Fan, 8,-13,10,10; Truong d. David Li, 3,-4,6,-7,9; Kokotov d. Christopher Carothers, -7,5,5,11. 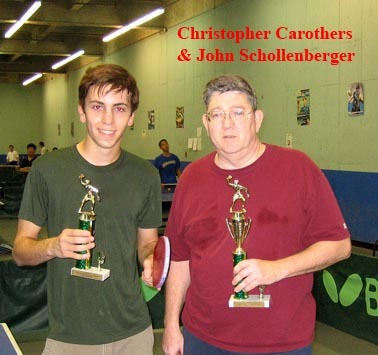 U1350 – Final: John Schollenberger d. Christopher Carothers, -6,5,7,9; SF: Schollenberger d. Jeffrey Kaplan, 12,5,-4,4; Carothers d. Amit Chanda, -6,-9,7,8,10; QF: Schollenberger d. Pavan Bhargava, 7,5,11; Kaplan d. Matthew Sedlock, 6,6,-7,7; Carothers d. James Zhan, 4,-13,6,10; Chanda d. Daniel Kokotov, 9,7,-9,-5,13. U1100 – Final: Varvara Zemskova d. Lily Zhen, 5,-9,7,7; SF: Zemskova d. Nina Zhen, 9,10,-9,-7,7; L.Zhen d. Carson Truong, 5,-15,8,-8,9; QF: Truong d. Johnny Truong, 6,9,7; L.Zhen d. Ex Pow-Anpongkul, 5,10,6; N.Zhen d. Yiheng Zhao, 11,-2,7,5; Zemskova d. Pavan Bhargava, 7,13,-8,4. With the Maryland Table Tennis Center’s air conditioning yet to be repaired, the most important factor in this tournament besides the players’ levels was the humidity. This, plus the severe summer hear, made for sticky playing conditions where spin was almost nonexistent. Still the players battled on gamely and put on a good show. In the Open event preliminaries, all four top seeds advanced easily. Raghu Nadmichettu beat Changping Duan for first in his round robin in this evenly matched battle, with both rated 2163. Raghu won this match in impressive style, 3-1. In the semifinals, both Raghu and top seed Han Xiao were challenged, both winning 4-2 against Joseph Wang and Duan, respectively. In the final, Xiao was up 2-1 before losing the fourth game on an edge ball, 11-9. Just as it seemed that Raghu had some momentum, the humidity again became a big factor, and he couldn’t seem to gain any sort of control in the final two games, losing the final two at 6 and 5. Still, Raghu put on a strong performance that was appreciated by the spectators. 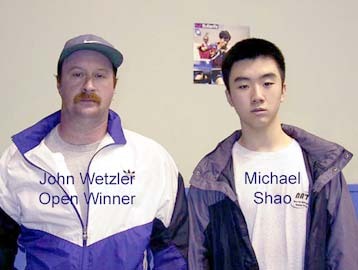 He would later win the 2250 event over Joseph Wang. Other strong performers include Julian Waters (second in both U1950 and U2100), Joseph Wang (second in U2250 and Open semifinalist). Kian Mokhtari (1630), who has showed improvement in the last few MDTTC tournaments, again had an excellent tournament, taking home first in the U1900 and U1650 events. 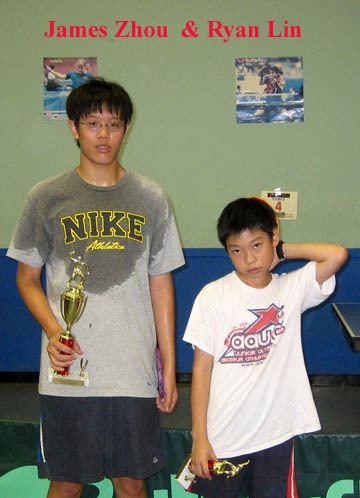 Two junior players, Eric Tsai and James Zhan dominated the U1400 event, with Eric defeating James 3-0 in the final. Open – Final: Han Xiao d. Raghu Nadmichettu, -15,3,5,-9,6,5; SF: Xiao d. Changping Duan, -9,7,11,-9,6,7; Nadmichettu d. Joseph Wang, 10,10,-7,9,-5,8. U2250 – Final: Raghu Nadmichettu d. Joseph Wang, -6,8,9,11; SF: Nadmichettu d. Patrick Lui ,6,-11,3,4; Wang d. Julian Waters, 5,4,-11,9. U2100 – Final: Patrick Lui d. Julian Waters, -11,7,-5,8,5; SF: Lui d. Fernando Ramirez, 8,9,-5,8; Waters d. Peter Hua, 10,-9,6,9. 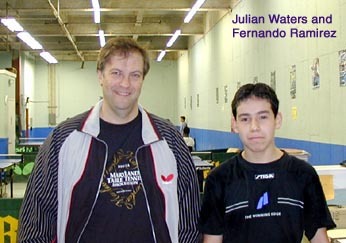 U1950 – Final: Fernando Ramirez d. Julian Waters, 4,3,8; SF: Ramirez d. David Jarrin, 4,3,6; Waters d. Xin Wan, 4,7,11. U1900 – Final: Kian Mokhtari d. Gahraman Mustafayev, 8,9,5; SF: Kian Mokhtari d. Frank Lee, -7,5,9,5; Gahraman Mustafayev d. Toby Kutler, -6,9,-4,11,5. U1650 – Final: Kian Mokhtari d. Paul Park, 6,7,12; SF: Kian Mokhtari d. Eric Tsai, 7,7,3; Paul Park d. Rohit Dewan, 11,-4,9,9. U1400 – Final: Eric Tsai d. James Zhan, 8,10,9; SF: Eric Tsai d. Paul Park, -4,5,-8,7,7; James Zhan d. Christopher Carothers, 8,4,-7,-4,7. U1150 – Final: Justin Leonard d. Matthew Sedlock, -10,6,-5,7,7; SF: Justin Leonard d. Yiheng Zhao, 7,10,10; Matthew Sedlock d. Nina Zhen, -9,5,8,4. The Open event was sparsely attended this time around, with Han Xiao (2564) the only player over 2200. However, Lixin Lang (2197) still received some nasty surprises from a pair of promising Maryland juniors, losing 3-1 in his round robin to Peter Li (2024, age 12), followed by Amaresh Sahu (1988, age 13), 3-2 in the quarterfinals. In the end, Han Xiao defeated Peter Li 4-0 in the final. In the Under 2200 event, Amaresh Sahu upset Peter Li 3-1 in the round to advance (only one player per group advanced in this event). 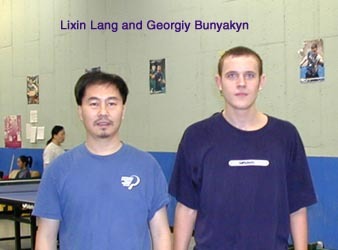 However, Lixin Lang gained redemption here by capturing the championship due to a default in the final by Gary Fraiman (2066), who had beaten Sahu in the semifinals. 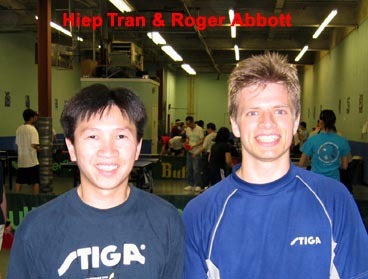 In the final of Under 2050, Roger Abbott (1863) upset Hiep Tran (2014) 3-2 to win the title. Kian Mokhtari (1597, age 15) continued his run of impressive tournaments by winning the Under 1900 event, 3-1 in the final over Chiman Kwan (1661). In Sunday’s events, junior players dominated in Under 1850 and Under 1350. 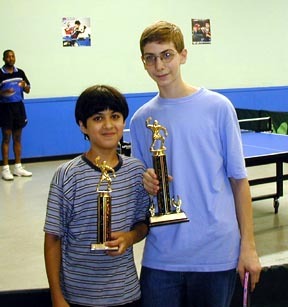 Keahan Mokhtari (11) defeated Rohan Gilkes in the Under 1850 final. In Under 1350, another junior, David Wang (12), upset three players in the RR and playoff rounds to win the first place trophy, 3-2 in the final over Orlando Russell. 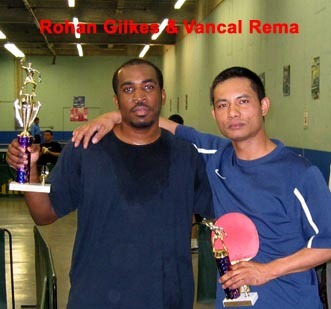 In Under 1600, both Rohan Gilkes and Vancal Rema had easy wins in the semifinals, but they had to fight very hard in the final, which Rohan finally won, -8, 6, -6, 9, 12, for his second trophy in the tournament. The Under 1100 championship match was between Thomas and Christopher Carathers, father and son. The father, Thomas, was the winner, 3-2. Open – Final: Han Xiao d. Peter Li, 6,3,2,3; SF: Xiao d. Amaresh Sahu, 7,5,8,7; Li d. Raghu Nadmichettu, 9,12,9,7; QF: Sahu d. Lixin Lang, 10,-12,4,-6,8; Nadmichettu d. Gary Fraiman, 9,9,-7,2. 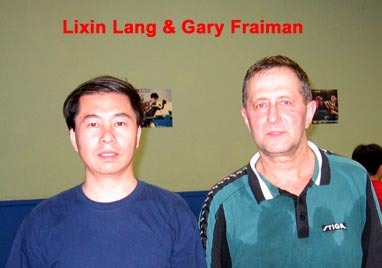 U2200 – Final: Lixin Lang d. Gary Fraiman, def. ; SF: Lang d. Hiep Tran, -9,6,7,6; Fraiman d. Amaresh Sahu, 5,2,7. U2050 – Final: Roger Abbott d. Hiep Tran, 2,-7,-6,9,7; SF: Abbott d. Thong Van Bui, 5,2,8; Tran d. Patrick Lui, 9,-11,8,9; QF: Bui d. Jimmy Pappadeas, -10,-5,8,6,11; Abbott d. Fernando Ramirez, 8,-10,-14,0,8; Lui d. Seyed Saadat, 4,9,-6,9; Tran d. Kevin Ma, 11,8,5. 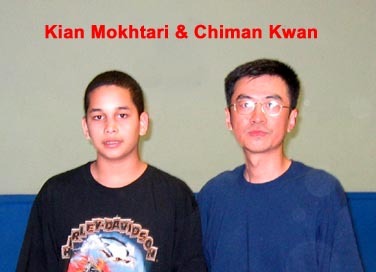 U1900 – Final: Kian Mokhtari d. Chiman Kwan, 10,8,-10,5; SF: Mokhtari d. Paul Chuasiriporn, 5,-7,-6,7,8; Kwan d. Xin Wan, 8,-3,4,6; QF: Kwan d. Paul Kovac, -11,9,7,-6,5; Mokhtari d. Vancal Rema, -9,-9,15,5,7. 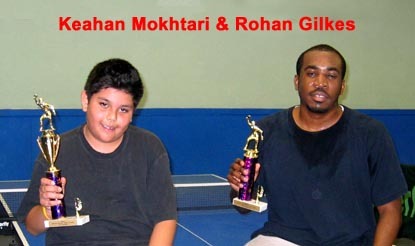 U1850 – Final: Keahan Mokhtari d. Rohan Gilkes, 8,9,1; SF: Mokhtari d. Vancal Rema, 7,9,9; Gilkes d. Toby Kutler, -7,-9,8,6,9. U1600 – Final: Rohan Gilkes d. Vancal Rema, -8,6,-6,9,12; SF: Rema d. David Wang, 5,6,14; Gilkes d. Vikash Sahu, 4,3,5; QF: Wang d. Donna Rogall, 6,7,7; Sahu d. Bitgood, 7,5,9. U1350 – Final: David Wang d. Orlando Russell, -8,4,7,0,10; SF: Russell d. Amy Xiao, 5,12,-11,-8,8; Wang d. Thomas Carothers, 9,7,6. U1100 – Final: Thomas Carothers d. Christopher Carothers, 5,3,-5,-13,11; SF: T.Carothers d. Nina Zhen, -5,6,8,6; C.Carothers d. Daniel Cohen, 8,-10,-9,10,6; QF: Zhen d. Varvara Zemskova, 9,-10,10,9. 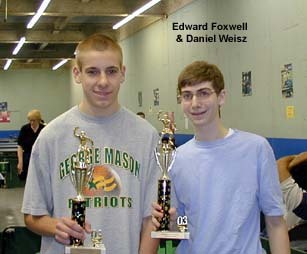 About 70 players from MD, VA, DE, PA, NJ and even CA took part in the 2005 MDTTC February Open. It is always nice to see so many familiar faces along with lots of new players. In the Open event, there were many scares but very few actual upsets. The only upset of the event was the defeat for the second consecutive tournament of John Wetzler (2315) by Lixin Lang (2103). Wetzler explained that he was forced to switch to new pips on the backhand because his previous pips had broken, and so was not playing very well. James Duan (2242) was given a scare by Raghu Nadmichettu (2162), prevailing 11-8 in the fifth. He also had difficulty with Vitaliy Deyak from Ukraine (estimated 2050), coming back from down 0-2 to win 11-3 in the fifth game again. In the semifinals, top seed Han Xiao (2565) defeated Wetzler 4-1, and Duan steamrolled Lang 4-0. In the final, Duan easily won the first game before losing steam, finally losing 4-1. Vitaliy and Lixin played a consolation match of sorts when they met in the Under 2250 finals, which Vitaliy won at 10,-6,6,7. 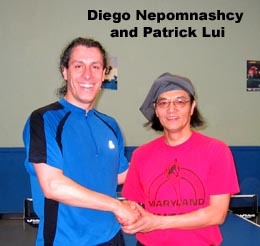 Diego Nepomnashcy (1914) won the Under 2100 event over Patrick Lui (1992), 3-1. 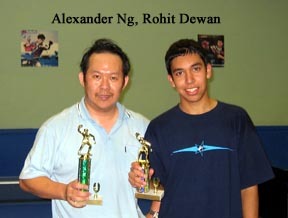 Fernando Ramirez (1933) won the Under 1950 event as the second seed, upsetting Mark Radom (1940) in the final, also 3-1. 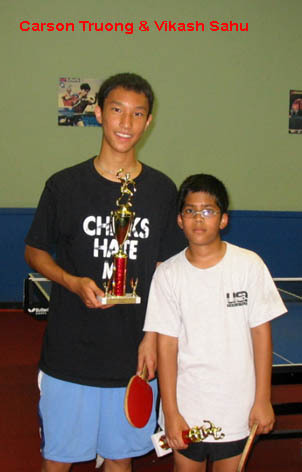 Junior players dominated both the Under 1900 and Under 1650 events. In the Under 1900 final, 11-year-old Charlie Sun was down 1-2 to Vincent Ning, another 11-year-old, but gradually took control of the match to win 3-2. 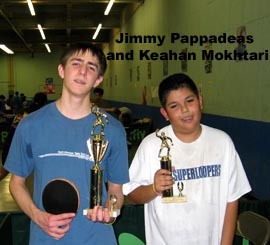 The most exciting drama was in the Under 1650 final between two more junior boys, Jimmy Pappadeas and Keahan Mokhtari. In deciding fifth game, Keahan has a huge 10-4 match point lead but couldn’t score any of his six match points. Jimmy played very smart, and with a combination of spinning loops and heavy pushes to Keahan’s backhand, won 8 points in a row to win the fifth, 12-10! Vancal Rema won the Under 1400's. 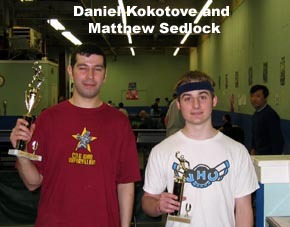 Daniel Kokotove has a close match against Matthew Sedlock from John Hopkins University, 3-2 in the Under 1150 final. This is the third time Daniel has won this event in MDTTC Opens. Congratulations to both players! Open – Final: Han Xiao d. James Duan, -5,4,6,3,8; SF: Xiao d. John Wetzler, 3,-10,4,11,7; Duan d. Lixin Lang, 5,10,8,7; QF: Wetzler d. Raghu Nadmichettu, 9,8,-5,9; Duan d. Vitaliy Deyak, -8,-9,4,6,3. U2250 – Final: Vitaliy Deyak d. Lixin Lang, 10,-6,6,7; SF: Deyak d. Raghu Nadmichettu, 9,-7,8,-7,8; Lang d. Patrick Lui, 5,-7,9,5; QF: Lui d. Diego Nepomnashcy, Def. ; Deyak d. Reza Ghiasi, 10,-10,9,4. U2100 – Final: Diego Nepomnashcy d. Patrick Lui, 9,8,-8,9; SF: Nepomnashcy d. Fernando Ramirez, 9,-8,3,7; Lui d. Mark Radom, 8,8,9; QF: Nepomnashcy d. Reginald Willis, 5,-10,8,8; Ramirez d. Patrick Kubat, -3,7,8,11; Radom d. Reza Ghiasi, 7,-10,4,9; Lui d. Thomas An, 9,-12,5,8. U1950 – Final: Fernando Ramirez d. Mark Radom, -5,8,11,8; SF: Ramirez d. Charlie Sun, 8,7,3; Radom d. Reginald Willis, 9,8,6; QF: Willis d. Jimmy Pappadeas, 7,-9,7,-5,6; Sun d. Kian Mokhtari, 9,8,-8,7. U1900 – Final: Charlie Sun d. Vincent Ning, 9,-11,-7,6,9; SF: Sun d. Gahraman Mustafayev, 4,10,6; Ning d. Jimmy Pappadeas, -7,-9,6,4,12; QF: Mustafayev d. Nathan Kung, -9,5,5,-10,4; Pappadeas d. Herren Wu, 8,8,5. U1650 – Final: Jimmy Pappadeas d. Keahan Mokhtari, 6,-9,-6,11,10; SF: Pappadeas d. Darryl Boyer, 6,0,5; Mokhtari d. Vancal Rema, -10,9,6,-7,6; QF: Boyer d. Ralph Holm, 3,7,9; Rema d. Justin Kung, 4,4,4. U1400 – Final: Vancal Rema d. (Name withheld by request), 5,-6,11,2; SF: Rema d. Daniel Kokotov, 10,7,5; (Name withheld) d. Leona Madison, 5,7,5; QF: Rema d. David Wang, 7,11,-6,9; Kokotov d. Eric Tsai, Def. ; (Name withheld) d. Ex Pow-Anpongkul, 3,3,8; Madison d. Ralph Holm, -6,-8,6,10,6. U1150 – Final: Daniel Kokotove d. Matthew Sedlock, 6,-8,9,-9,7; SF: Kokotove d. Edward Foxwell, 9,8,-8,-8,9; Sedlock d. Christopher Carothers, 9,9,-8,7; QF: Sedlock d. Alva Marc Pepper, 4,6,-2,-5,11; Foxwell d. Nina Zhen, 9,-7,7,-7,2. 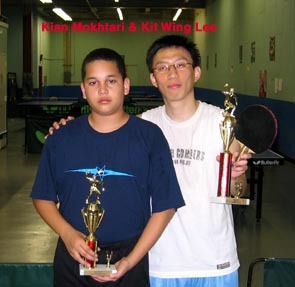 The 2004 MDTTC Fall Open is the last MDTTC tournament for this year. The tournament attracted more than 70 players from MD, VA, PA and visitors from California. The Open event of the October Open was riddled with upsets, mostly involving junior players, even more so than the previous tournaments held here at the MDTTC. 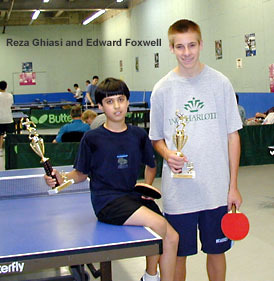 Reza Ghiasi (1951, age 12) began the festivities with a minor upset of Barbara Wei (1965, age 16) to make the playoffs. In the round of 16, two of the top four seeds went down. Third seed Nazruddin Asgarali (2247) fell to fellow Elite-Leaguer Lixin Lang (2098), while fourth seed Raghu Nadmichettu (2221, age 17) lost to practice partner Marcus Jackson (1982, age 12). Marcus went on to get a game off Han Xiao (2545, age 17), losing 4-1 in the semifinals. In the other semifinal, Lixin Lang continued his impressive run, upsetting John Mark Wetzler (2304) 4-1. 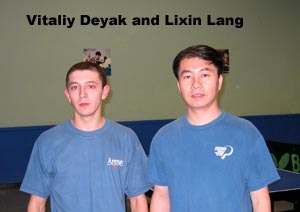 In the final, Han Xiao quickly defeated Lixin Lang for first place. Lixin continued his great tournament by winning the U2200 event over Barbara Wei, 12-10 in the fifth, after being down 9-6 and 10-9 match point. Other notable mentions include all the juniors in general who did well. 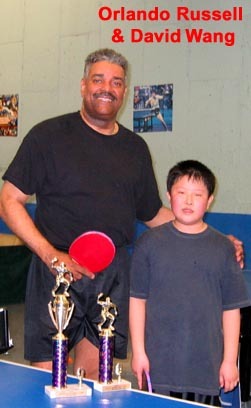 Peter Li (1973, age 11) won the U2050 event. Keahan Mokhtari (1213, age 11) upset both Kevin Bembridge (1586) and Aaron Smolarz (1564) to make the playoffs, then made it all the way to the semifinals until he lost to eventual winner, also a junior, Jimmy Pappadeas (1540, age 14). Benjamin Huang (911, age 15) won the U1100 event over Daniel Kokotov (1013). It was interesting that most of the U1100 event was composed of unrated players, the first time that this has happened in a very long time, which is intriguing and exciting due to its indication of a good number of new players getting involved with both our club and the sport. Open – Final: Han Xiao d. Lixin Lang, 2,9,6,9; SF: Xiao d. Marcus Jackson, -6,7,3,9,1; Lang d. John Wetzler, 9,-12,6,9,3; QF: Xiao d. Peter Li, 6,3,7; Jackson d. Raghu Nadmichettu, 6,-4,9,9; Lang d. Nazruddin Asgarali, 5,8,4; Wetzler d. Reza Ghiasi, 7,5,6. U2200 – Final: Lixin Lang d. Barbara Wei, 9,-6,-6,4,10; SF: Lang d. Patrick Lui, -8,5,19,7; Wei d. Hiep Tran, 7,4,2; QF: Lang d. Oscar Ramirez, 10,7,9; Lui d. Dan Barrett, 4,7,7; Wei d. Peter Li, 8,-5,8,9; Tran d. Fernando Ramirez, 8,-9,7,11. U2050 – Final: Peter Li d. Hiep Tran, 10,-11,9,5; SF: Li d. Patrick Lui, -9,7,7,6; Tran d. Fernando Ramirez, -15,9,-7,6,7; QF: Li d. Chi Zhang, 4,3,6; Lui d. Kevin Ma, 2,9,7; F.Ramirez d. Julian Waters, 8,5,9; Tran d. Reginald Willis, 9,6,5. 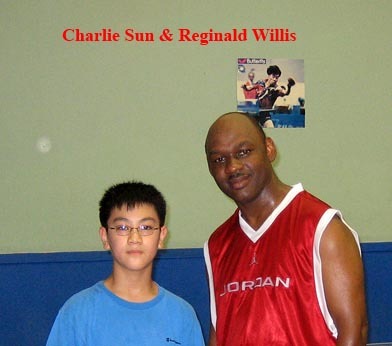 U1900 – Final: Oscar Ramirez d. Reginald Willis, -12, 10,8,-10,10; SF: O.Ramirez d. Charlie Sun, 9,5,3; Willis d. Eric Dang, -8,6,16,10. U1850 – Final: Jimmy Pappadeas d. David Terrelonge, 4,-7,10,4; SF: Pappadeas d. Keahan Mokhtari, -10,6,9,9; Terrelonge d. Ayomikun Adeleye, -7,-12,8,7,4; QF: Pappadeas d. Alexander Ng, 9,-9,9,9; Terrelonge d. Kevin Bembridge, 10,4,6; Mokhtari d. Justin Kung, 9,5,6; Adeleye d. Charlie Sun, 8,10,11. U1600 – Final: Alexander Ng d. Rohit Dewan, 1,-11,11,6; SF: Ng d. Keahan Mokhtari, 7,4,4; Dewan d. Vanlal Rema, 12,8,8. U1350 – Final: [Name withheld by request] d. Caleb Fan, -10,9,-6,10,9; SF: (Name withheld) d. Gerik Whittington, def. ; Fan d. Benjamin Huang, 8,8,-8,8; QF: (Name withheld) d. Troy Gryting, 10,6,7; Whittington d. Nathan Kung, 12,-11,9,-10,9; Fan d. Matthew Willson, 9,-7,6,6; Huang d. Daniel Kokotov, -9,10,6,10. U1100 – Final: Benjamin Huang d. Daniel Kokotov, -9,4,9,2; SF: Huang d. Christopher Carothers, 8,10,5; Kokotov d. Vikash Sahu, -9,8,6,8; QF: Huang d. Ex Pow-Anpongkul, 10,6,8; Kokotov d. Rachel Madison, 4,11,3; Sahu d. Matthew Sedlock, 6,6,-8,-9,9; Carothers d. [Name withheld by request], def. 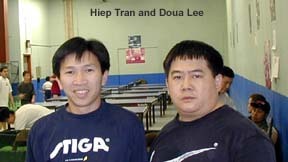 In the 2004 June Open, there were three round robins, with two players advancing from each. In the first round robin, Amaresh Sahu (1830) upset Bonggoy Cruz (2032) 3-0 to force a three-way tie. Sahu advanced second behind Han Xiao (2604). In the second group, Tacky Santelices (2265), who had not played since 1996, won his group easily, with Raghu Nadmichettu (2048) advancing second over Lixin Lang (2093). In the last round robin, John Wetzler (2234) showed good form in upsetting Nazruddin Asgarali (2251), 3 games to 1. Asgarali advanced second behind Wetzler in this group. In the quarterfinals, both would advance easily over Nadmichettu and Sahu, respectively. In the semifinals, Asgarali lost two close games to Xiao, 9 and 8, before things got out of hand and Xiao took the next two easily at 4 and 6 to go into the final without dropping a game. The second semifinal was not so much of a walk in the park. Wetzler took the first game over Santelices at 11-8. However, John’s normally big forehand loop seemed a little too big on this day; he often overlooped the ball as he dropped the next three at 7, 7, and 11. Down 3-1, it seemed as if Wetzler was done. However, in the fifth, Santelices missed two serves at deuce to hand Wetzler the game. Errors plus fatigue eventually cost Tacky the match, as John gained confidence and completed the comeback, winning the next two games each at 7. Despite this good win, Wetzler seemed to have used all of his energy. 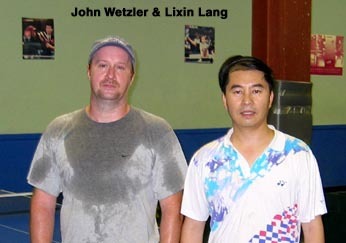 Facing a fresh Han Xiao in the final, Wetzler was unable to put up much of a fight, losing at 4, 4, 3, and 4. Open – Final: Han Xiao d. John Wetzler, 4,4,3,4; SF: Xiao d. Nazruddin Asgarali, 9,8,4,6; Wetzler d. Tacky Santelices, 8,-7,-7,-11,11,7,7; QF: Asgarali d. Raghu Nadmichettu, 8,7,5; Wetzler d. Amaresh Sahu, 6,8,5. U2250 – Final: John Wetzler d. Lixin Lang, -10,7,9,10; SF: Wetzler d. Raghu Nadmichettu, 10,11,-12,6; Lang d. Luisito Escobar, -11,3,7,4; QF: Nadmichettu d. Patrick Lui, 10,11,-12,6; Escobar d. Peter Li, 4,4,-12,-9,8. U2100 – Final: Lixin Lang d. Raghu Nadmichettu, 7,-10,7,7; SF: Lang d. Bonggoy Cruz, 10,7,-9,-8,3; Nadmichettu d. Peter Li, -8,9,-5,5,4; QF: Lang d. Patrick Kubat, 8,5,8; Cruz d. Patrick Lui, -7,6,-7,9,10; Li d. Julian Waters, 4,-5,9,7; Nadmichettu d. Chi Zhang, -9,8,-8,11,3. U1950 – Final: Chi Zhang d. Julian Waters, -7,6,7,8; SF: Zhang d. Reginald Willis, 5,10,11; Waters d. Xinsheng Michael Huang, 8,-10,8,-7,4; QF: Huang d. Paul Kovac, 4,8,10; Willis d. Fernando Ramirez, -5,6,7,-10,10. U1900: 1st Charlie Sun; 2nd Ray Chen; 3rd Kian Mokhtari; 4th Keahan Mokhtari. U1400 – Final: Tai-Chi Shan d. Justin Kung, -7,8,3,10; SF: Shan d. Nathan Kung; J.Kung d. Israel Dumbuya, 7,-2,-8,8,8; QF: N.Kung d. Matthew Willson, 8,7,7; Dumbuya d. Clement Munno, 9,-8,-9,8,9. U1150 – Final: Alin Chioveanu d. Toby Kutler, 7,11,7; SF: Kutler d. Mark Scala, 8,6,5; Chioveanu d. Christopher Carothers, 4,-9,9,5; QF: Scala d. Dumitru Rotaru, -5,-8,8,7,10; Carothers d. Noah Weisz, 4,5,10. 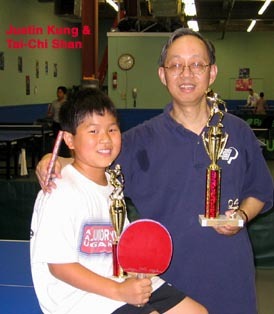 2004 MDTTC Spring Open saw a number of players performing admirably, including a couple players taking home multiple prizes. Starting out in the Open event, junior player Marcus Jackson (1910), although unable to pull out a match, battled both Hiep Tran (2029) and Joseph Stewart (2087) to the fifth and deciding game, where he lost both matches. However, it must be said that he gave eventual semifinalist Stewart a good match, consistently retrieving balls and spinning very well for the most part, and that both Tran and Stewart would go on to win rating events. Stewart would lose to Han Xiao (2604), who had been seeded out of the preliminary round robins. On the other half, Michael Shao (2190), who had beaten Stewart in the round robin, barely sneaked past Raghu Nadmichettu (2054), 11-7 in the fifth and deciding game. However, he would lose a seven-game match to James Duan (2209) in the semifinals after battling back from a formidable 2-0 deficit. Duan was able to win the first game against Xiao in the finals, 11-8, but couldn’t hold on, losing at 3,8,6, and 5, and reluctantly accepting second place. In the 2200 event, Patrick Kin Lue Lui (2016), noted for his very dead rubber on the forehand and strange style, made an impressive run through the playoffs. After defeating Reginald Willis (1799) with relative ease at 8,7, and 4, he pulled out a good win over a nervous Raghu Nadmichettu, 11-7 in the fifth and final game. However, he would have to settle for second, losing to an energetic Joseph Stewart in the finals, 3 games to 1. In the 2050 event, Lui again made it to the finals, defeating a surprisingly tough unrated player, Chi Zhang (estimated 1750), whose blazing long serves were not enough to overcome Lui Again, however, Lui was denied in the finals, this time by Hiep Tran, whose steady play was just enough to defeat Lui, 9, -9,4, and 11. In the 1900 event, the finals saw Fernando Ramirez (1856) meeting Chi Zhang. These two would meet three times in the tournament, with Ramirez only winning once. This final match happened to be Ramirez’s only win over Zhang, -9,9,8,8, good for the under 1900 title. 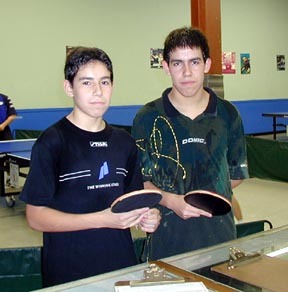 In the 1850 event, two very young junior players took first and second. Devin Zhang (1664), the top seed, dropped two games total in a 6-person round robin to take the title. Meanwhile, Charlie Sun (1502), upset Timo Kivio (1530) and Kin Ng (estimated 1600) to take second despite his fourth-place seeding. In the 1600 finals, Donald Franklin (1431) was able to overcome a formidable 2-0 deficit to win in the fifth game, 12-10, over Kian Mokhtari (1042). 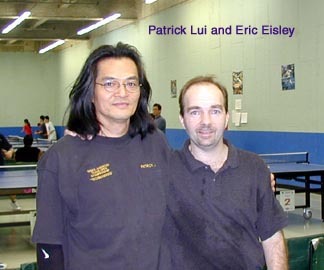 Perhaps Kian should have a talk with Patrick Lui about how to win finals, because Kian also made the finals of the 1350 event, where he lost to his own brother, Keahan Mokhtari (848), 11-9 in the fifth after coming back from a 2-0 deficit to tie the match at 2 games apiece. Finally, in the 1100 event, Terry Degendorfer (1004), on business from far away Minnesota, took his share of Maryland rating points in the tournament. He also added a first-place trophy, defeating fellow Minnesota man Josh Stevens (1049) in the semis and Justin Kung (902) in the finals to win the title. Although the field of players was a bit smaller this time around (43 players) due to long weekend and spring break, the tournament ran smoothly, and hopefully all the contestants had fun and played their best. Open Singles – Final: Han Xiao d. James Duan, -8,3,8,6,5; SF: Xiao d. Joseph Stewart, 5,8,7,1; Duan d. Michael Shao, 10,-11,-10,4,0,-6,7; QF: Duan d. Shao d. Raghu Nadmichettu, 12,-9,9,-9,7. U2200 – Final: Joseph Stewart d. Patrick Lui, -10,8,9,8; SF: Stewart d. Hiep Tran, 7,-9,12,10; Lui d. Raghu Nadmichettu, 9,-7,9,-3,7; QF: Tran d. Marcus Jackson, -8,8,10,9; Lu d. Reginald Willis, 8,7,4. U2050 – Final: Hiep Tran d. Patrick Lui, 9,-9,4,11; SF: Tran d. Reza Ghiasi, 7,3,5; Lui d. Chi Zhang, 11,10,9; QF: Ghiasi d. Reginal Willis, 10,5,7; Zhang d. Fernando Ramirez, 12,-10,-8,11,9. U1900 – Final: Fernando Ramirez d. Chi Zhang, -9,9,8,8; SF: Ramirez d. Rita Wu, -7,3,8,10; Zhang d. Reginald Willis, 8,9,6. 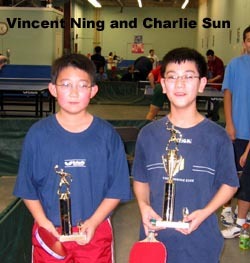 U1850 – Final RR: 1st Devin Zhang, 5-0; 2nd Charlie Sun, 4-1; 3rd Timo Kivio, 3-2. U1600 – Final: Donald Franklin d. Kian Mokhtari, -5,-8,10,4,10; SF: Franklin d. Terry Degendorfer, 6,-11,4,5; Mokhtari d. Lutz Filipowskey, -8,8,4,11; QF: Filipowskey d. Felix Sun, -13,7,9,6; Degendorfer d. Nathan Kung, 8,10,-9,9. U1350 – Final: Keahan Mokhtari d. Kian Mokhtari, 9,11,-5,-5,9; SF: Keahan Mokhtari d. Terry Degendorfer, 7,8,10; Kian Mokhtari d. Nathan Kung, 2,-9,10,8; QF: Kung d. Felix Sun, -8,8,6,-6,7; Kian Mokhtari d. Josh Stevens, -8,-6,9,10,8; Degendorfer d. Barbara Bitgood, 9,-9,6,7; Keahan Mokhtari d. Daniel Weisz, 6,13,-9,8. U1100 – Final: Terry Degendorfer d. Justin Kung, 4,7,7; SF: Degendorfer d. Josh Stevens, -10,7,3,-4,14; Kung d. Thomas Carothers, 6,-7,-9,3,8. 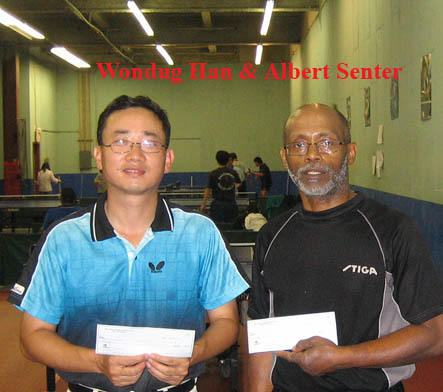 In the MDTTC Winter Open, 16 players competed for the new $120 prize (previously $100). 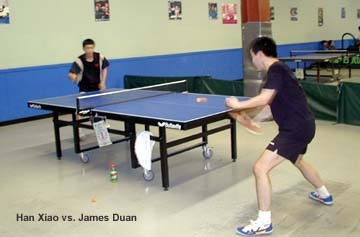 The field boasted many members of the MDTTC Elite League, which meets at the club a few times a month, so there should have been no surprises. Just about every match in the playoffs and even a few in the round robins were very suspenseful and came down to the wire. In the preliminary rounds, U.S. #1 rated junior Han Xiao, rated 2604 after making the U.S. National Team at the recent U.S. team trials, and John Wetzler (2296) advanced as expected without much of a struggle as the top two seeds. In the third round robin, Raghu Nadmichettu (recently #8 in under 18 in the country, but whose rating has recently dropped to 2068) suffered two heartbreaking fifth game losses to come in third, knocking him out of the tournament (he would, however, win the Under 2100 event and come in second in the Under 2250 event to chopper/looper Gary Fraiman). Nazruddin Asgarali (2256) sneaked past Michael Shao (2174) in five games to win the group, with Michael advancing second. Khaleel Asgarali (2255) and James Duan (2220) played for first and second in the fourth and final group, with Khaleel squeaking by, 13-11 in the fifth game. The drama continued in the playoffs. In the quarterfinals, Han Xiao defeated Martine Olineny (2134) in three straight games, but going for a loop in the third, he caught his thumb and racket on the edge of the table, receiving a nasty gash in the process that would hamper his play later on. James Duan won the first two games against Nazruddin Asgarali before falling 11-8 in the fifth. Nazruddin’s Bergmann style serves were very effective in this match. John Wetzler found himself down 2-1 against Lixin Lang (2103), but was able to avoid the upset, winning the fourth game 12-10 and then comfortable closing out the deciding game 11-4. The highlight match this round, however, featured Michael Shao against Khaleel Asgarali, a battle of two junior players currently ranked #6 and #8 in the U.S. After splitting the first two games, Michael took a surprising 2-1 lead with an 11-2 game. Khaleel looked very disappointed, but managed to take the next game at 9. In the last game, Khaleel looked like he had all the momentum as Michael prepared to serve, down 5-7. Michael served quick and down the line, catching Khaleel off guard, who then hooked it around the net on the run for what appeared to be an edge. After comments from a few onlookers, Khaleel graciously gave the point to Michael on the presumption that the ball had in fact hit the side and not the edge. However, Michael grabbed the opportunity and tied the game at 7. After a few seesaws in leads, Michael found himself up 10-9. Khaleel served, Michael made a routine return, and the two began to rally at this crucial point, with Michael finally missing a nervous-looking forehand counterloop. However, at deuce, Khaleel’s forehand, which had looked suspect the whole match, failed him, allowing Michael to pull off the upset, 12-10. In the semifinal, Michael competed hard against Han Xiao and had a few leads, but couldn’t hold on, losing 4-0. Nazruddin Asgarali played excellent at crucial points against John Wetzler, winning 4-2 after dropping the first two games, as he had in the quarterfinals against Duan. 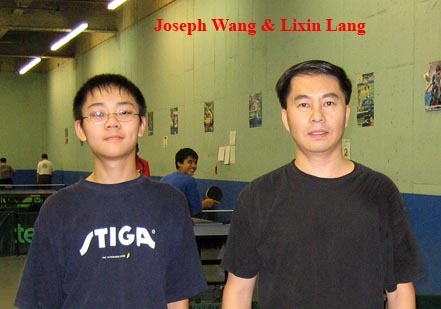 This set up a final between him and Han Xiao. After Han won the first game at 5, Nazruddin surprised him in the second game by jumping out to a big lead in the second and won at 7. Han won the next game at 5, but Nazruddin tied the match again, winning the fourth game at 8 and putting the pressure back on Han. Han responded in game five, fighting hard for perhaps the first time in the tournament, again winning at 5, and jumping out to an 8-4 lead in the sixth. It looked like the match was over until an apparent lapse in concentration saw Nazruddin come back to 8-6, 8-7, tie it at 8, then take a 9-8 lead. However, Han slowed down, served, and ripped a backhand. 9-9. Nazruddin served, Han stepped around and looped it into Nazruddin’s middle, who blocked it into the net. Han again attacked Nazruddin’s serve, and wins the match 4-2, along with $120 and a few blood smears on his shirt from the gash on his thumb. Besides the open event, a surprise in the tournament came thanks to 1682-rated 12-year-old Reza Ghiasi, who upset 2049-rated Terry Lonergan, 1849-rated Gary Liu, and 1789-rated Shafi Yousifauni in the Under 2100 round robin even, only to lose to 1927-rated Julian Waters in the quarterfinals. Multiple finalists in the tournament were Raghu Nadmichettu (Under 2250 Finalist, Under 2100 Champion) and Alan Butler (Under 1650 Finalist, Under 1400 Champion). The quad of Maryland 17-year-olds – Han Xiao, Khaleel Asgarali, Michael Shao and Raghu Nadmichettu – once again had fine performances. Congratulations to all of these players, along with all the other participants for a well-played tournament. Open Singles – Final: Han Xiao d. Nazruddin Asgarali, 5,-7,5,-8,5,9; SF: Xiao d. Michael Shao, 9,9,13,4; N. Asgarali d. John Wetzler, -9,-7,6,4,9,8; QF: Xiao d. Martine Olineny, 8,6,4; Shao d. Khaleel Asgarali, -11,8,2,-9,10; N. Asgarali d. James Duan, -7,-4,4,9,8; Wetzler d. Lixin Lang, 11,-7,-9,10,4. Under 2250 – Final: Gary Fraiman d. Raghu Nadmichettu, 8,-8,8,10; SF: Fraiman d. Vladimir Poradich, def. ; Nadmichettu d. Lixin Lang, 6,4,13; QF: Lang d. Martine Olineny, 8,12,-9,1; Nadmichettu d. Pegah Ghiasi, 4,7,-8,3; Poradich d. Patrick Lui, -11,-6,11,1,8. Under 2100 – Final: Raghu Nadmichettu d. Vladimir Poradich, def. ; SF: Nadmichettu d. Julian Waters, 9,13,5; Poradich d. Terry Lonergan, 6,8,7; QF: Lonergan d. Fernando Ramirez, 8,-5,7,-9,7; Poradich d. Gary Fraiman, 8,8,-8,8; Waters d. Reza Ghiasi, 9,3,6; Nadmichettu d. Patrick Lui, 8,-9,5,9. Under 1950 – Final: Thuy Tran d. Xeng Ly, -3,2,9,6; SF: Tran d. Julian Waters, 6,-9,-9,8,8; Ly d. Fernando Ramirez, 8,-5,9,5; QF: Waters d. Chiman Kwan, 7,8,4; Tran d. Shafi Yousifauni, -6,9,11,7; Ramirez d. Patrick Lui, -11,-5,7,13,9; Ly d. Reza Ghiasi, 6,7,2. 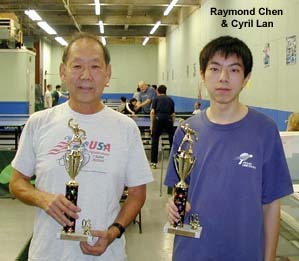 Under 1900 – Final: Raymond Chen d. Cyril Lan, 7,-10,6,-8,6; SF: Chen d. Donald Franklin, 1,5,3; Lan d. Charlie Sun, 9,5,13. 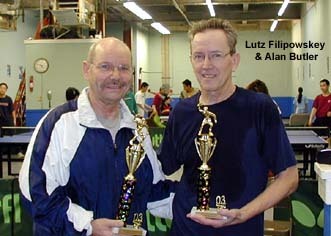 Under 1650 – Final: Lutz Filipowskey d. Alan Butler, 10,-6,8,8; SF: Butler d. Kit Wing Lee, 16,-10,7,5; Filipowskey d. Fong Hsu, 6,9,10; QF: Butler d. Richard James, -9,6,7,8; Filipowskey d. Jianqing Lan, -7,9,8,10. Under 1400 – Final: Alan Butler d. Richard James, def. ; SF: James d. Matthew Wilson, -7,4,3,-9,4; Butler d. Gerik Whittington, 0,4,-5,-9,8; QF: James d. Keahan Mokhtari, -5,7,5,6; Wilson d. Grant Roch, 7,4,-13,12; Whittington d. Toby Kutler, 6,3,6; Butler d. Kian Mokhtari, 9,-7,7,8. Under 1150 – Final: Daniel Weisz d. Edward Foxwell, 10,12,12; SF: Foxwell d. John Vos, -15,5,-6,6,7; Weisz d. Matthew Wilson, 7,-6,9,-14,4; QF: Vos d. Christopher Carothers, 9,6,8; Foxwell d. Thomas Carothers, 11,9,-6,11; Wilson d. Trong Nguyen, 3,2,8; Weisz d. Bud Bergstrom, 4,8,6. More than 70 players convened at the Maryland Table Tennis Center on October 11-12 to participate in 8 events in the MdTTC October Open. In the under 1900 event, Peter Li had a great day, upsetting four players in winning the event. Among his victims were Shafi Yousifani (1801), Oscar Ramirez (1867), and Julian Waters (1880). 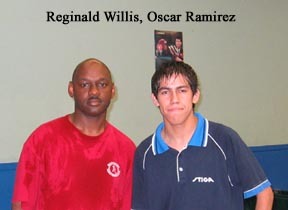 He also upset Fernando Ramirez (1892) in the U2050 event. Peter's luck would run out in the U2200 event, however, losing both his matches in his round robin in being eliminated and to Gary Liu in the U2050 event. 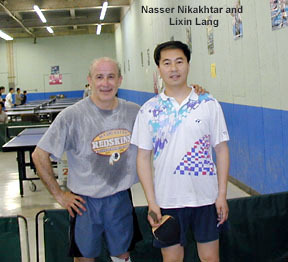 In the Open, unrated Hank Chen upset Nasser Nikakhtar and Elaine Kwok, both rated over 2000, to advance to the quarterfinals, where Larry Hodges eliminated him, while seed Samson Dubina from Ohio easily eliminated Lixin Lang (2108) in four straight games. James Duan defeated Larry Hodges 4-0 in the semifinals, with Hodges switching to a chopping game in the last two games, and leading 7-2 in the third before losing at 9. These matches led to a dramatic final. Dubina went up 2-0 quickly as Duan made a number of careless mistakes. However, Duan would come back soon after to tie it up at 2-2. When it seemed like Duan had momentum, he would play a tentative 5th game to go down 3-2. He almost came back in this game from a hopeless 4-10 deficit and brought the score to 9-10, then missed an anticlimactic counterloop to lose it. He then tied it again with a well-played game at 3-3 to set up a deciding 7th game for the open title. Duan came out firing a few dazzling counterloops to go up 3-1, but Samson's serves soon became a factor. Throughout the second half of the fifth game, Duan could not cope with Dubina's long sidespin serves, and lost 11-8. Match and the MdTTC October Open title to Samson Dubina from Ohio. In the U2050 event Patrick Kin Lue Lui, the second seed, lost to both Peter Li and Travis Jones (1680) to make a disappointing exit. 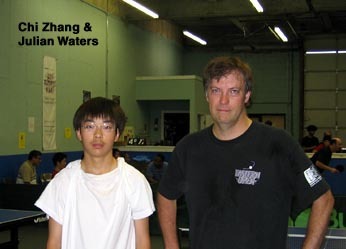 Eventually, same round robin players Julian Waters and Gary Liu would meet in the finals. In the U2200 event, top seed Lixin Lang breezed through his section of the bracket to advance almost effortlessly into the finals, where he defeated second seed Joseph Stewart to claim the prize. The U1850 event also went as expected to top seed Roberto Huertas (1767) from Puerto Rico despite many players who entered. The U1600 event had a few more surprises. Top seed Raymond Chen (1572) withdrew after preliminary round robin. Third seed Nicolae Popovici and fourth seed Orlando E. Russell were also surprisingly eliminated in their round robins. This left second seed, 14 years old Andrew Marcus (1518) as the top seed remaining by far in the draw, clearing the way for his close 7-in-the-5th win over Fong Hsu (1185) in the finals. Reza Ghiasi (1138) won the U1350 event over Linden Li (983) in a battle of two young junior players in the final, 3-0. 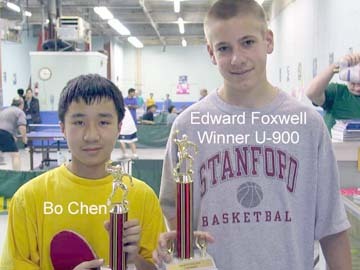 Li had previously upset two 1100 players, Frank Lee and Fong Hsu, the U1600 finalist, in order to make it to the finals. Finally, the U1100 event was won by Kian Mokhtari (1044), the top seed, who was aided by a number of upsets in the top half of the bracket, notably of second seed Vivek Sastri (1031). Open – Final: Samson Dubina d. James Duan, 7,9,-7,-8,9,-7,8; SF: Dubina d. Lixin Lang, 6,8,8,9; Duan d. Larry Hodges, 1,5,9,4; QF: Lang d. Joseph Stewart, 5,6,9; Hodges d. Hank Chen, -8,6,9,8. U2200 – Final: Lixin Lang d. Joseph Stewart, 10,8,5; SF: Lang d. Fernando Ramirez, 7,2,7; Stewart d. Raghu Nadmichettu, 8,11,9; QF: Ramirez d. Doua Lee, -6,9,9,8; Nadmichettu d. Ivar Dejong, 13,8,8. U2050 – Final: Julian Waters d. Gary Liu, 7,6,9; SF: Waters d. Robert Huertas, 8,8,-8,8; Liu d. Peter Li, 7,5,2; QF: Waters d. Kevin Ma, 10,9,7; Liu d. Shafi Yousifauni, -8,10,7,12; Huertas d. Travis Jones, 9,-8,9,-15,8; Li d. Fernando Ramirez, 12,-9,11,8. U1900 – Final: Peter Li d. Julian Waters, 6,-9,11,7; SF: Li d. Oscar Ramirez, 4,6,8; Waters d. Gary Liu, 6,-6,8,-13,9; QF: Li d. Roberto Huertas, 9,4,7; Liu d. Shafi Yousifauni, 5,-10,8,9. U1850 – Final: Roberto Huertas d. Xinsheng Michael Huang, -9,9,9,7; SF: Huertas d. Andrew Marcus, 9,10,-6,6; Huang d. John Wu, 7,-8,6,9; QF: Huertas d. Devin Zhang, 9,-6,8,4; Marcus d. Andy Seto, -6,10,10,-7,8; Wu d. Raymond Chen, 10,-8,9,10; Huang d. Reza Ghiasi, -9,5,7,6. U1600 – Final: Andrew Marcus d. Fong Hsu, 9,-9,1,-8,7; SF: Marcus d. Reza Ghiasi, -11,5,9,11; Hsu d. Troy Gryting, 7,9,-7,-8,8; QF: Marcus d. David Helmer, 2,5,7; Hsu d. Grant Roch, 6,7,5; Ghiasi d. Alice Li, 2,2,7; Gryting d. Frank Lee, -12,-8,8,10,8. U1350 – Final: Reza Ghiasi d. Linden Li, 9,6,8; SF: Ghiasi d. Grant Roch, 9,9,4; Li d. Fong Hsu, -5,6,9,4; QF: Ghiasi d. Nathan Kung, 5,0,7; Li d. Frank Lee, 9,-10,10,11; Roch d. Bo Chen, 6,-10,7,7; Hsu d. Vivek Sastri, 7,6,7. U1100 – Final: Kian Mokhtari d. Rohit Dewan, 8,-11,4,3; SF: Mokhtari d. Edward Foxwell, 8,1,3; Dewan d. David Wang, 9,-7,7,12; QF: Mokhtari d. Keahan Mokhtari, 10,3,12; Foxwell d. Amy Xiao, 1,5,8; Wang d. Sonya Lu, 6,11,0; Dewan d. Vivek Sastri, -10,9,-8,9,11. The MDTTC June Open, in all actuality, should have been named the MDTTC May/June Open, as half the events were actually played on May 31, the other half on June 1. However, this trivial detail did not affect the turnout of almost 60 players who came to test their skills or just to have fun. The open event saw a field similar to the April Open, with Han Xiao winning the event, only dropping one game in his semifinal match. James Duan took home second place, and Khurram Aziz pulled off two good wins to reach the semis, one over Pegah Ghiasi and the other an upset over Raghu Nadmichettu. Khurram continued to pull off upsets in the Under 2250 event, defeating Lixin Lang, but lost to eventual winner Naser Nikakhtar in the semifinals. 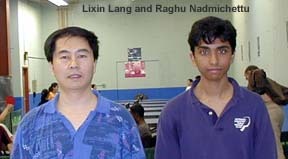 Nasser defeated Lixin Lang in the final, the same Lixin who had beaten him convincingly in the preliminary RR of the Open event… the U2100 event was equally confusing. Olayinka Adeshiyan was able to advance from his group despite being the 4th seed, and Kevin Ma also advanced with an upset over Paul Kovac. Two upsets in the semifinals put 1820-rated Joseph Wang and 1908-rated Julian Waters in the final, where Julian Waters won rather easily, 3-1. In the U1950 event, 1744-rated Paul Kovac was the victim of two upsets, one to Peter Li and one to 1490-rated Tomer Aronheim. The final was a rematch of the U2100 final, with Julian again winning 3-1. In the Sunday events, defending U1100 champion Reza Ghiasi upset Vivek Sastri to clear the path to an U1150 title. His cause was helped by the fact that 851-rated Josh Stevens from Minnesota, who had upset Reza in the round robin, lost to Edward Foxwell in the quarterfinals. 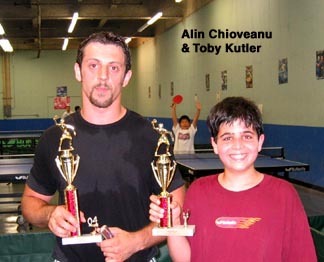 In the U1900 event, Olayinka Adeshiyan upset John Anderson in the round robin, but was upset by Vincent Ning. He redeemed himself by upsetting first seed Andy Seto in the finals, 11-9 in the fifth! In the under 1400 event, 851-rated Josh Stevens pulled off two more upsets to advance second in his group. Reza Ghiasi and Aaron Smolarz also pulled off upsets to advance. 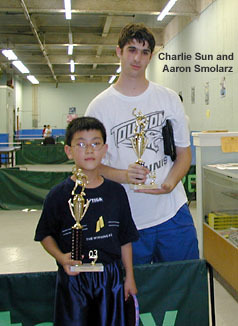 First seed Aaron Smolarz and second seed Charlie Sun made it to the final, where Charlie pulled off the upset easily, 3-0. In the U1650 event, the last event of the tournament, Olayinka Adeshiyan capped off his tournament with his second event won, bringing home both the under 1900 and under 1650 events. The tournament was full of upsets and deciding game wins, and everyone seemed to have a great time. Overall, the tournament was another well-conducted one, with every event on time and with no major disturbances. Open – Final: Han Xiao d. James Duan, 6,8,9,6; SF: Xiao d. Lixin Lang, 15,10,6,-9,5; Duan d. Khurram Aziz, 8,7,4,9. U2250 – Final: Nasser Nikakhtar d. Lixin Lang, 9,-9,7,9; SF: Nikakhtar d. Khurram Aziz, -8,8,4,7; Lang d. Raghu Nadmichettu, 7,-7,11,9. U2100 – Final: Julian Waters d. Joseph Wang, 9,2,-10,7; SF: Waters d. Khurram Aziz, 6,9,6; Wang d. Patrick Lui, 11,9,10; QF: Waters d. Kevin Ma, 8,2,8; Wang d. Olayinka Adeshiyan, 2,7,8. U1950 – Final: Julian Waters d. Joseph Wang, 9,7,-7,14; SF: Waters d. Peter Li, 6,-5,4,-5,7; Wang d. Chiman Kwan, 5,10,5; QF: Waters d. Samuel Huang, 7,-11,5,9; Li d. Herren Wu, 6,8,2; Wang d. Tomer Aronheim, 9,9,9; Kwan d. Kevin Ma, 9,2,10. 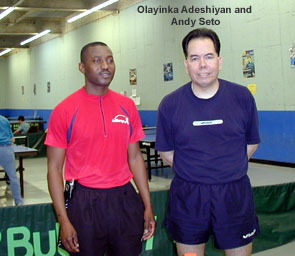 1900 – Final: Olayinka Adeshiyan d. Andy Seto, 7,9,-9,-9,9; SF: Adeshiyan d. Janiel Le, 4,1,9; Seto d. Vincent Ning, 9,9,7. 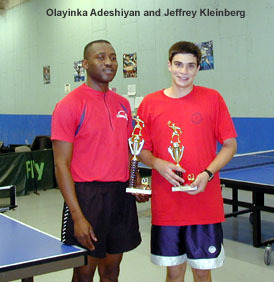 U1650 – Final: Olayinka Adeshiyan d. Jeffrey Kleinberg, 6,8,2; SF: Adeshiyan d. Donald Franklin, 9,8,8; Kleinberg d. Aaron Smolarz, 7,-8,6,4; QF: Franklin d. Vincent Ning, -2,10,5,2; Smolarz d. Reza Ghiasi, 9,-4,-6,9,2. U1400 – Final: Charlie Sun d. Aaron Smolarz, 11,11,5; SF: C.Sun d. Jeffrey Kleinberg, -9,3,3,-9,9; Smolarz d. Josh Stevens, 10,-10,6,7; QF: Stevens d. Jimmy Pappadeas, 7,-8,5,-5,7; Kleinberg d. Reza Ghiasi, -5,4,9,2. U1150 – Final: Reza Ghiasi d. Edward Foxwell, -12,8,4,10; SF: Ghiasi d. Terry Degendorfer, -8,9,9,12; Foxwell d. Felix Sun, -9,7,7,10; QF: Ghiasi d. Vivek Sastri, -8,6,3,7; Degendorfer d. Shyueh-Chien Cheng, -12,-8,10,6,9; F.Sun d. Babara Bitgood, 5,10,9; Foxwell d. Josh Stevens, 17,8,-6,-8,8. More than 60 players participated in a two-day tournament at the Maryland Table Tennis Center, April 12-13. Although this tournament wasn’t the biggest attention-grabber, there was still a great amount of competition. 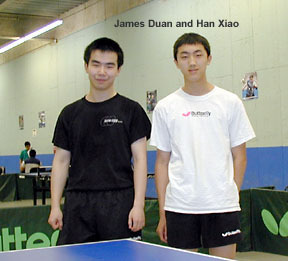 Han Xiao won the Open over James Duan, 4-1. This was largely uncontested. Tran Hiep (2042) won the Under 2050 event, losing only three games in the process. Later, he was upset in Under 2200 by Doua Lee, an 1864 player who beat everyone in his group, even though he was the last seed. 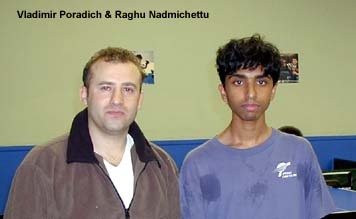 Raghu Nadmichettu won this event by pulling out many close five- and four-game matches. In the semifinals, Raghu beat sometimes practice partner Joseph Stewart in five, -9,9,7,-8,7, to advance to the final. 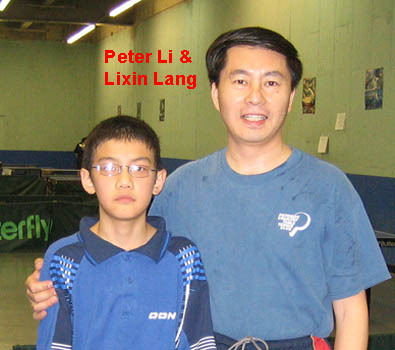 There he played top seed Lang Lixin, a penhold short pips blocker. Down 0-2, he pulled it out in five, -6,-8,8,10,6. The Under 1900 event was wild and unpredictable. The top seed Julian Walters (1887) advanced as top seed in his group, only to lose to Ly Xeng (a chopper) in the semifinals. Eric Dang, the top seed in his group, did not advance. Instead, a 1387 player named Chiman Kwan beat everyone and advanced from the group along with Ly Xeng. 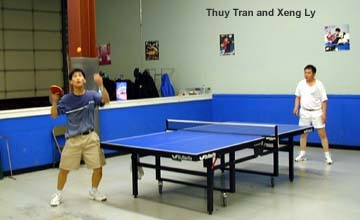 Ly Xeng won the final over Tran Thuy in straight games. The person who caused the most upsets was Doua Lee, who beat many 2000 plus players this tournament, only losing to Julian Walters 3-0 in the Under 2050 event round robin and Tran Hiep in the Under 2050 semifinal. Doua Lee beat many people with his unorthodox “half-Seemiller” style. 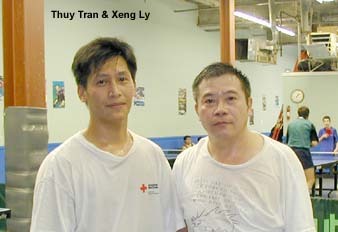 He and his brother Ly Xeng took home the Under 2050 finalist and Under 1900 champion prizes. 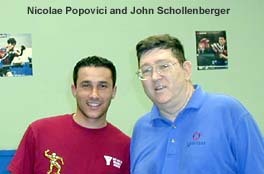 Nicolae Popovici was also a giant-killer this tournament. Rated 1315, he took home both the Under 1350 and Under 1850 events, losing only to Herren Wu in the Under 1850 preliminary round. In the Under 1100 event, Reza Ghiasi defeated Benjamin Huang in a battle of two juniors to take away the trophy. Finally, in the last event on Sunday afternoon, Herren Wu won the Under 1600 event after upsetting 1523-rated Olayinka Adeshiyan in the semifinals in a hard-fought 5-game match, and easily defeating 9-year-old Janiel Li in the final. As usual, the tournament ran smoothly and in a timely fashion, and all the winners (and even some of the losers) left with smiles on their faces. Congratulations to all of the participants for a job well done. Open Singles – Final: Han Xiao d. James Duan, 11,-10,4,7,4; SF: Xiao d. Joseph Stewart, 6,8,-7,2,14; Duan d. Lixin Lang, -9,2,10,5,-7,7; QF: Duan d. Hiep Tran, 7,10,-6,12; Stewart d. Charlene Liu, 3,-9,0,11. 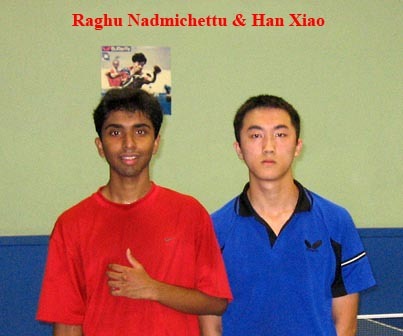 U2200 – Final: Raghu Nadmichettu d. Lixin Lang, -6,-8,8,10,6; SF: Nadmichettu d. Joseph Stewart, 9,-9,7,-8,7; Lang d. Doua Lee, 3,-6,3,6; QF: Lang d. Pegah Ghiasi, 6,5,4; Lee d. Richard Bowling, 9,-15,6,-6,8; Nadmichettu d. Naser Nikakhtar, 6,-3,10,7; Stewart d. Georgiy Bunyakyn, 7,8,9. U2050 – Final: Hiep Tran d. Doua Lee, -8,10,9,9; SF: Tran d. Julian Waters, -7,6,-5,8,7; Lee d. Oscar Ramirez, 10,-7,9,9. U1900 – Final: Xeng Ly d. Thuy Tran, 9,12,6; SF: Tran d. Shafi Yousifauni, 5,10,8; Ly d. Waters, 8,6,-4,8; QF: Ly d. Xinshen Michael Huang, 6,-9,7,11; Yousifauni d. Chiman Kwan, 8,-9,7,4. U1850 – Final: Nicolae Popovici d. Panha Sok, 9,8,9; SF: Sok d. Herren Wu, -4,7,6,6; Popovici d. Olayinka Adeshiyan, 7,8,8. U1600 – Final: Herren Wu d. Janiel Li, 8,6,6; SF: Wu d. Olayinka Adeshiyan, 7,-9,-4,11,2; Li d. Charlie Sun, 6,8,-8,7; QF: Li d. Donald Franklin, 12,6,-6,6; Wu d. Richard James, -9,10,8,10. U1350 – Final: Nicolae Popovici d. John Schollenberger, -8,6,10,5; SF: Popovici d. Richard James, 9,-11,4,9,5; Schollenberger d. Reza Ghiasi, -10,8,9,6; QF: Ghiasi d. Benjamin Huang, 9,9,8; Popovici d. Bo Chen, 2,4,2. U1100 – Final: Reza Ghiasi d. Benjamin Huang, 4,7,-8,8; SF: Ghiasi d. Noah Weisz, 1,7,8; Huang d. Randy Turner, 7,-7,8,-8,12; QF: Ghiasi d. Brian Benneth, 8,6,9; Noah Weisz d. Daniel Weisz, 5,-8,-10,5,10; Huang d. Amy Xiao, 6,4,8; Turner d. Matthew Wilson, -7,-7,8,7,4. In most major tournaments, you get a surprise; the first seed usually doesn’t plow through the competition. Although the MDTTC Open wasn’t an attention-grabber with its about 67 participating players crammed into an industrial park warehouse, there were still plenty of surprises and upsets to go around. The first surprise of the tournament was that I was forced to withdraw due to illness. Therefore, the first seed in the Open event was long pips player John Wetzler, rated 2288, who appeared to be favored to win the event. However, Wetzler struggled in his round robin, barely squeaking out a win against 2056-rated Pegah Ghiasi, 12-10 in the fifth. Wetzler managed to advance into the quarterfinals unscathed. Second seed Khaleel Asgarali advanced as well, but he needed some luck in order to do so. 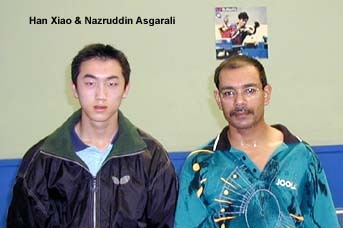 After losing to 1912-rated Chao Wang, Khaleel needed Wang to lose to Naser Nikakhtar, putting Asgarali, Wang, and Nikakhtar in a three-way tie. Asgarali and Wang advanced to the next round. Also needing a bit of luck was third seed Larry Hodges. 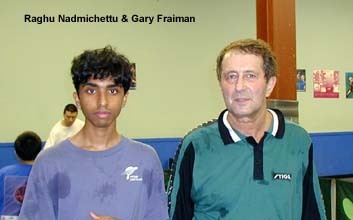 In a match against Raghu Nadmichettu, Larry found himself down 4-10 in the fifth. But Larry’s experience would pay off as he rallied back to lead 11-10. Still, Larry couldn’t find a way to stop Raghu’s barrage of backhand and forehand smashes, and lost quite unfortunately at 16-14 in the fifth game after a gallant effort. Luckily, Hodges defeated Nazruddin Asgarali 3-0, and after Asgarali easily beat Nadmichettu the second three-way tie of the event moved Asgarali and Hodges into the next round. The surprises continued in the playoffs. 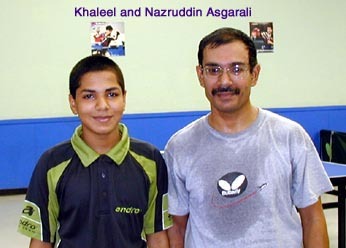 After Khaleel Asgarali defeated Larry Hodges easily 4-0 (7,9,11,10), his father Nazruddin was in a heated battle against Wetzler. After trading leads in games, the match went to a deciding seventh. Wetzler grew annoyed at himself for missing serves and making various other mistakes, allowing Nazruddin to win by a convincing 11-2 in the seventh…Surprise, surprise, father vs. son in the finals. This time, age defeats youth in an exciting 11-9 in the seventh match. The open event was certainly the most exciting series of matches that the Maryland Table Tennis Club has seen in some time. The surprises and great matches extended to some of the other events as well. Larry Hodges avenged his earlier loss to Raghu Nadmichettu in the playoffs of the U2250 event, only to lose in the next round to pips-out blocker Lixin Lang, rated 1999, who would emerge as the winner of the event. Julian Waters looked to win the U1950 event, but was stopped by 1704-rated penhold attacker Fernando Ramirez, and had to settle for second place. Julian finally “redeemed” himself by winning the U1900 final, an 11-9 thriller against Brian Ponczak, rated 1597. In the U1400, Some of the young juniors played some tight matches. Charlie Sun lost a match against Aaron Smolarz after being up 8-3 in the fifth game, while Vincent Ning also lost a tight match after being ahead. There was even a surprise in the U1150 event. 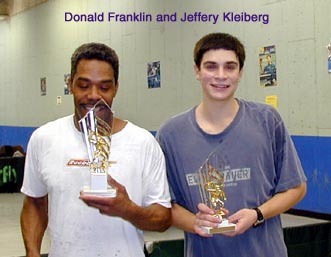 Donald Franklin (estimated 550) ripped through the event until he reached the final, where he faced 1016 rated Jeffery Kleiberg. Down 2-0 in the best of five match, Franklin rallied to capture the title and a first place trophy, 11-7 in the fifth. The tournament was a success, well organized and on time thanks to tournament director Wei Xiao and the work of Larry Hodges in attracting participants. There was no lack of surprises or exciting matches, and nearly all the participants enjoyed themselves. In conclusion, the MDTTC February Open was one of the most eventful tournaments that the club has seen so far. Open Singles – Final: Nazruddin Asgarali d. Khaleel Asgarali, 6,5,-6,-6,6,-8,9; SF: A.Asgarali d. John Wetzler, 9,-9,-9,7,7,-6,2; K.Asgarali d. Larry Hodges, 7,9,11,10; QF: N.Asgarali d. Chao Wang, 9,-6,2,6; Hodges d. Torsten Boeker, 7,5,10. U2250 – Final: Lixin Lang d. Georgiy Bunyakyn, 8,7,12; SF: Lang d. Larry Hodges, 7,8,-6,8; Bunyakyn d. Joseph Stewart, -8,4,-7,8,7; QF: Lang d. Pegah Ghiasi, 6,11,-8,8; Hodges d. Raghu Nadmichettu, 9,12,9; Bunyakyn d. Oscar Ramirez, 8,-8,-3,8,9; Stewart d. Eric Eisley, -9,10,8,-8,9. U2100 – Final: Eric Eisley d. Patrick Lui, 4,9,4; SF: Eisley d. Joseph Stewart, 6,8,-9,4; Lui d. Oscar Ramirez, 11,4,3; QF: Eisley d. Fernando Ramirez, 7,4,6; Lui d. Naser Nikakhtar, 9,9,7; Stewart d. Lixin Ling, 10,-5,3,-7,6; Oscar Ramirez d. Chao Wang, def. U1950 – Final: Fernando Ramirez d. Julian Waters, 9,7,4,-9,8; SF: Ramirez d. Paul Kovac, 3,-9,7,11; Waters d. Peter Li, 7,14,-6,4; QF: Ramirez d. Chiman Kwan, 9,-8,4,5; Le d. Andy Seto, -9,9,2,11. 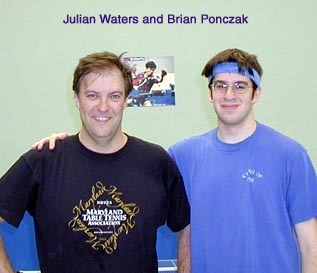 U1900 – Final: Julian Waters d. Brian Ponczak, -9,5,8,-9,9; SF: Waters d. Janiel Li, 4,7,8; Ponczak d. Devin Zhang, 5,4,-4,2. 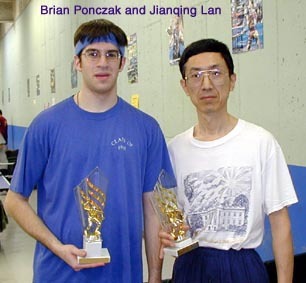 U1650 – Final: Brian Ponczak d. Jianqing Lan, 7,6,-10,7; SF: Ponczak d. Olayinka Adeshiyan, 8,2,7; Lan d. Vincent Ning, -9,3,-6,6,9; QF: Ponczak d. Darryl Boyer, -6,7,6,7; Adeshiyan d. Krishna Nerella, 9,-6,7,8; Lan d. Warren Evans, -9,7,6,4; Ning d. Donald Franklin, 6,6,5. U1400 – Final: Krishna Nerella d. Nicolae Popovici, 8,11,-4,-6,8; SF: Nerella d. Steve Buckles, 3,5,7; Popovici d. Aaron Smolarz, 3,6,9; QF: Nerella d. Jeffery Kleiberg, -9,4,-7,6,5; Buckles d. Vivek Sastri, 7,8,9; Smolarz d. Charlie Sun, -5,10,-4,9,12; Popovici d. Warren Evans, -9,5,5,-8,2. U1150 – Final: Donald Franklin d. Jeffery Kleiberg, -10,-6,5,6,7; SF: Franklin d. Reza Ghiasi, 9,10,4; Kleiberg d. Aaron Smolarz, 8,9,5; QF: Kleiberg d. John Vos, 6,8,3; Franklin d. Bernard R. Gibson, 6,9,9. Open – Final: John Wetzler d. Origene Nyanguile, 7,-8,-9,-7,6,8,8; SF: Nyanguile d. Georgiy Bunyakyn, 6,7,11,8; Wetzler d. James Duan, 9,9,10,8. Under 2150 – Final: Michael Shao d. Joseph Stewart, 9,9,9; SF: Shao d. Oscar Ramirez, 2,3,8; Stewart d. Lixin Lang, -7,8,8,7; QF: Ramirez d. Georgiy Bunyakyn, 8,8,8; Stewart d. X. Peter Huang, -9,9,9,10. U2000 – Final: Oscar Ramirez d. Joseph Stewart, 9,8,9; SF: O.Ramirez d. Fernando Ramirez, def. ; Stewart d. X. Peter Huang, def. ; QF: O.Ramirez d. Gary Liu, -10,9,4,6; F.Ramirez d. Peter Li, 4,8,11; Huang d. Quan Pham, 2,8,12; Stewart d. Wei Fan, 9,9,6,6. U1850 – Final: Fernando Ramirez d. Oscar Ramirez, def. 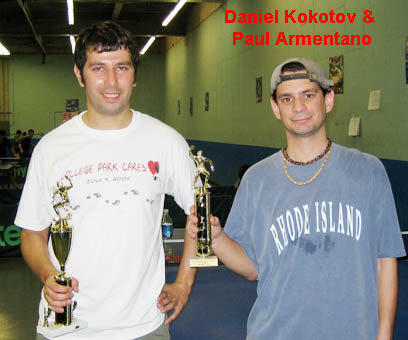 ; SF: F.Ramirez d. Thong Van Bui, -7,9,4,8; O.Ramirez d. Joseph Stewart, 10,-3,11,-4,8; QF: F.Ramirez d. Paul Kovac, 3,6,9; O.Ramirez d. Gary Liu, 9,12,8; Stewart d. Xinsheng Michael Huang, 15,4,9; Bui d. Peter Li, 6,3,-8,-8,9. U1800 – Final: Sohil Charania d. Sanjay Harwani, -7,6,8,4; SF: Charania d. Manuel Salazar, 9,7,-8,5; Harwani d. John Anderson, -7,8,-6,8,0; QF: Anderson d. Peter Li, 22,-10,6,5; Harwani d. Devin Zhang, 7,9,6; Sohil Charania d. Cyril Lan, 3,5,4; Salazar d. John Wu, 8,-6,-5,9,6. U1500 – Final: Sohil Charania d. Olayinka Adeshiyan, 8,8,9; SF: Charania d. Orlando Russell, 10,6,9; Adeshiyan d. Vincent Ning, -9,8,10,4; QF: Charnia d. Mark Cohen, 8,9,-5,6; Russell d. Michael Haynes, 8,8,-6,4; Adeshiyan d. Cyril Lan, def. ; Ning d. Michael Todd, -7,5,8,-0,6. U1200 – Final: Olayinka Adeshiyan d. Cyril Lan, -9,5,4,9; SF: Adeshiyan d. Mark Cohen, 5,3,6; Lan d. John Vos, -6,6,5,-9,5; QF: Cohen d. Eddie Mead, 8,5,-10,5; Adeshiyan d. Tomer Aronhein, -9,2,3,4; Vos d. Felix Sun, 7,6,9; Lan d. Janice Lan, 8,6,6. U900 – Final: Daniel Weisz d. Reza Ghiasi, 7,7,-10,6; SF: D.Weisz d. Tomer Aronhein, 6,7,-8,1; Ghiasi d. Charlie Sun, -3,-10,7,5,5; QF: Ghiasi d. Noah Weisz, 7,-10,7,4; D.Weisz d. Christopher Salazar, 3,9,-10,-8,7. Open Singles – Final: Han Xiao d. John Wetzler, -8,-9,-8,3,15,5,5; SF: Xiao d. James Duan, 7,6,7,-7,7; Wetzler d. Stafano Ratti, 7,-5,6,-9,8,-9,8; QF: Xiao d. Khurram Aziz, 5,7,3; Duan d. Changping Duan, def. ; Ratti d. Morris Jackson, -7,-10,7,8,8; Wetzler d. Philip Shaw, 9,9,-9,9. U2100 – Final: Khurram Aziz d. Raghu Nadmichettu, -7,7,8,5; SF: Aziz d. Gary Liu, 7,6,8; Nadmichettu d. Philip Shaw, 10,-4,7,6; QF: Liu d. Ayomikun Adeleye, 6,-6,10,-8,7; Nadmichettu d. Oscar A. Ramirez, 7,9,-3,9. 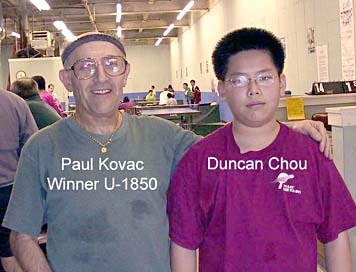 U1950 – Final: Philip Shaw d. Peter Huang, def. ; SF: Shaw d. Kiem Huo, 6,8,3; Huang d. John Anderson, 10,5,6; QF: Shaw d. Fernando E. Ramirez, 4,3,10; Huang d. Michael Lee Cohen, 2,5,-7,4; Anderson d. Oscar A. Ramirez, -9,9,12,14; Huo d. Thong Van Bui, 5,7,-9,-9,3. U1900 – Final: John Anderson d. Andy Seto, 8,-10,7,-10,7; SF: John Anderson d. Kiem Huo, 10,-5,3,9; Andy Seto d. Peter Li, 7,9,6; QF: Kiem Huo d. Amaresh Sahu, -9,6,11,1; Peter Li d. Gary Schlager, 8,7,6. U1600 – Final: Peter Zombori d. Natalia Farkas, -7,2,5,9; SF: Natalia Farkas d. Rolf Hendriks, -9,2,9,8; Peter Zombori d. Peter Li, 9,3,4; QF: Rolf Hendriks d. John M Zydell, 9,-5,7,10; Peter Li d. Anthony T. Lee, 5,5,6. U1300 – Final: Orlando E. Russell d. Michael Haynes, 8,7,7; SF: Orlando E. Russell d. David Ton, 8,3,8; Michael Haynes d. Tai-Chi Shan, 11,-9,8,-9,10; QF: Orlando E. Russell d. Jingping Yang, 5,6,10; David Ton d. Michael Todd, 5,8,6; Tai-Chi Shan d. Christina Jingsi Cheng, 5,7,-3,9; Michael Haynes d. Felix Sun, 11,14,9. U1000 – Final: Eddie Mead d. Vincent Ning, -6,-3,10,8,7; SF: Eddie Mead d. John G. Vos, 3,-7,5,5; Vincent Ning d. Daniel Weisz, 9,15,7; QF: John G. Vos d. Vivek Sastri, 9,9,-8,-7,4; Eddie Mead d. Illya Bunyakyn, -8,-7,8,9,6; Vincent Ning d. Dave Rovenolt, 8,-11,-6,7,8; Daniel Weisz d. David Wonderlich, 9,9,-9,9. Open – Final: John Wetzler d. Michael Shao, 4,9,-9,6,3; SF: Wetzler d. Lixin Lang, 6,3,9,-11,9; Shao d. Changping Duan, -11,8,8,-4,9,-9,5; QF: Lang d. Hiep Tran, 3,6,3; Shao d. Khurram Aziz, 9,5,-9,7. U2150 – Final: Stefano Ratti d. Michael Shao, 7,8,6; SF: Ratti d. Khurram Aziz, 4,-5,8,3; Shao d. Lixin Lang, 7,-7,5,-3,7; QF: Ratti d. Hiep Tran, 3,-9,8,8; Aziz d. Charlene Xiaoying Liu, 9,-9,9,-9,9; Lang d. Morris Jackson, 2,4,-9,9; Shao d. Kester Albo, -9,4,-9,9,5. 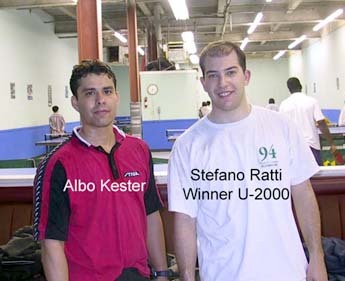 U2000 – Final: Stafano Ratti d. Kester Albo, 9,7,5; SF: Ratti d. Patrick Lui, 8,5,8; Albo d. Gary Liu, 5,5,6; QF: Liu d. Raghu Nadmichettu, 8,-6,7,-9,5; Lui d. Marcus Jackson, 2,6,6. U1850: Paul Kovac d. Duncan Chou, 3,0,8; SF: Kovac d. Michael Cohen, -8,4,10,9; Chou d. Gary Schlager, -5,11,-7,11,9; QF: Kovac d. Thong Van Bui, 8,6,-8,-9,9; Cohen d. Rick Martin, 9,-9,3,13; Chou d. Chiman Kwan, 9,-11,11,9; Schlager d. Joseph Wang, -5,3,-7,12,4. U1800: Ray Chen d. John Anderson, 8,2,-4,6; SF: Chen d. Amaresh Sahu, -8,5,7,4; Anderson d. Jeff Lee, 6,-9,-6,2,4; QF: Lee d. Duncan Chou, -5,9,9,10; Sahu d. Adam Gussow, -3,8,-9,9,12. 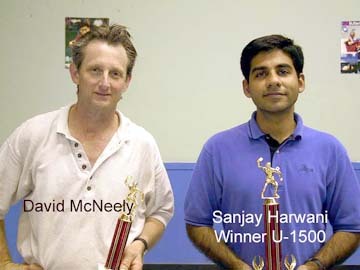 U1500: Sanjay Harwani d. David McNeely, 5,7,7; SF: Harwani d. Hanqing Zhou, 7,8,9; McNeely d. Thomas Manley, 7,8,9. 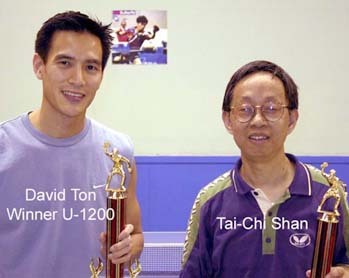 U1200: David Ton d. Tai-Chi Shan,7,-5,7,-9,6; SF: Ton d. Richard James, 0,8,8; Shan d. John Vos, 6,9,7; QF: Shan d. Randy Turner, 6,12,-7,8; Vos d. Vincent Ning, 8,7,7; James d. Michael Branch, 2,3,4; Ton d. Felix Sun, 7,-10,5,-6,9. U900: Edward Foxwell d. Bo Chen, 7,10,-8,10; SF: Foxwell d. Daniel Weisz, 9,7,-11,12; Chen d. Vincent Ning, 7,3,-7,4; QF: Foxwell d. Noah Weisz, 5,-13,8,-9,9; Weisz d. Devin Zhang, 9,9,8; Bo Chen d. Alice Li, 4,7,7; Ning d. Janiel Li, -5,5,10,-5,9. Open Singles – Final: Han Xiao d. Qasim Aziz (Han on left in photo), 6,-9,4,5,-6,6; SF: Xiao d. James Duan, 8,7,7,1; Q.Aziz d. John Wetzler, 7,8,10,-4,-5,8; QF: Xiao d. Xiaoying Liu, 10,7,10; Wetzler d. Khurram Aziz, 8,7,7; Duan d. Michael Shao, 4,-7,7,6; Q.Aziz d. Torsten Boeker, 4,3,9. Under 2250 – Final: James Duan d. Lixin Lang (James on right in photo), -8,11,-8,8,9; SF: Duan d. Khurram Aziz, -8,-8,8,8,8; Lang d. Ratti Stefano, 5,7,-8,7. 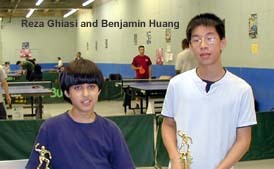 Under 2100 – Final: Khurram Aziz d. Lixin Lang (Khurram on right in photo), 9,-7,11,6; SF: Aziz d. Chao Wang, -10,13,3,-6,7; Lang d. Torsten Boeker, 8,11,5. 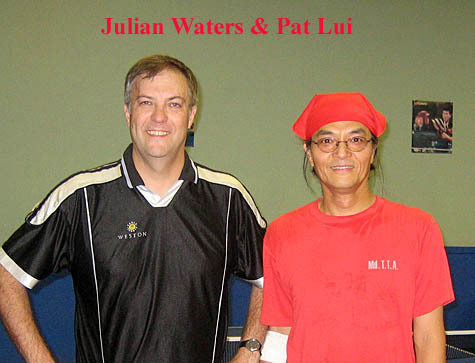 Under 1950 – Final: Julian Waters d. Patrick Lui (Julian on left in photo), -9,2,5,-13,9; SF: Waters d. Wayne Zhong, 7,4,4; Lui d. Paul Kovac, -4,3,4,8. 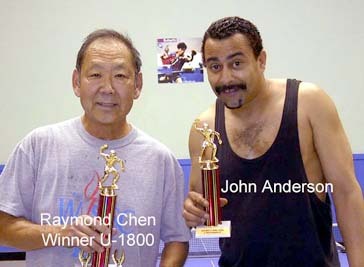 Under 1900 – Final: John Anderson d. Raymond Chen (John on left in photo), 11,6,8; SF: Anderson d. Peter Yeung, 8,7,-3,5; Chen d. Khaled Khalafallah, 3,6,5. Under 1600 – Final: Todd Bunte d. Rick Martin (Todd on left in photo), 10,8,4; SF: Bunte d. David Ton, 9,-10,-10,8,8; Martin d. Hari Seshadri, 2,5,5. Under 1300 – Final: Todd Bunte d. Mark Cohen (Todd on right in photo), 2,6,9; SF: Bunte d. Hari Seshadri, 5,6,9; Cohen d. Peter Li, 5,-7,-7,10,5. Under 1000 – Final: John Vos d. Linden Li (John on right in photo), 6,3,4; SF: Vos d. Janiel Li, 5,5,3; L.Li d. Vincent Ning, 7,-11,5,4.